A Tour Inside Our Home - Welcome! My goodness, it sure is frigid!! I hate to start a post by complaining about the weather, but when is this deep freeze going to end? Let's all pray for an early spring. Instead of a home in Maine, perhaps Tom and I should have gotten a beach condo in sunny Florida? 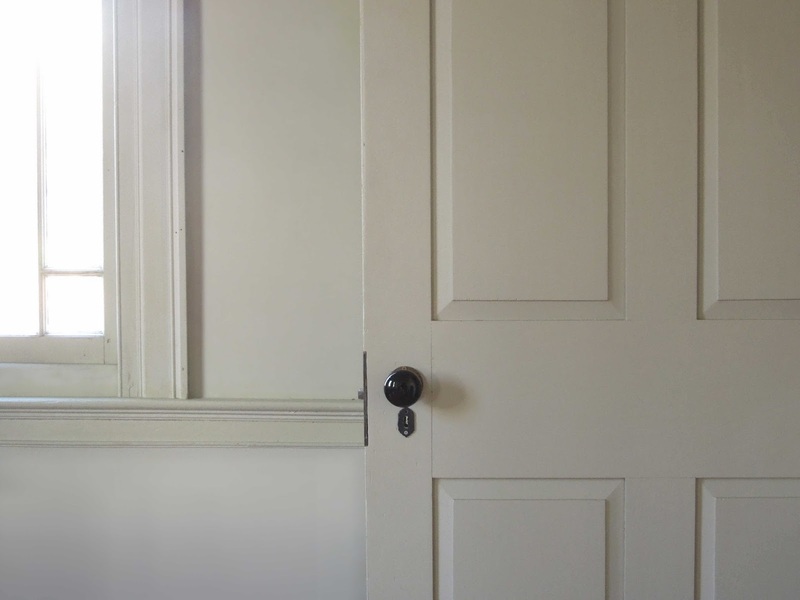 When Tom and I initially toured our circa 1804 home, we felt a sense of familiarity. 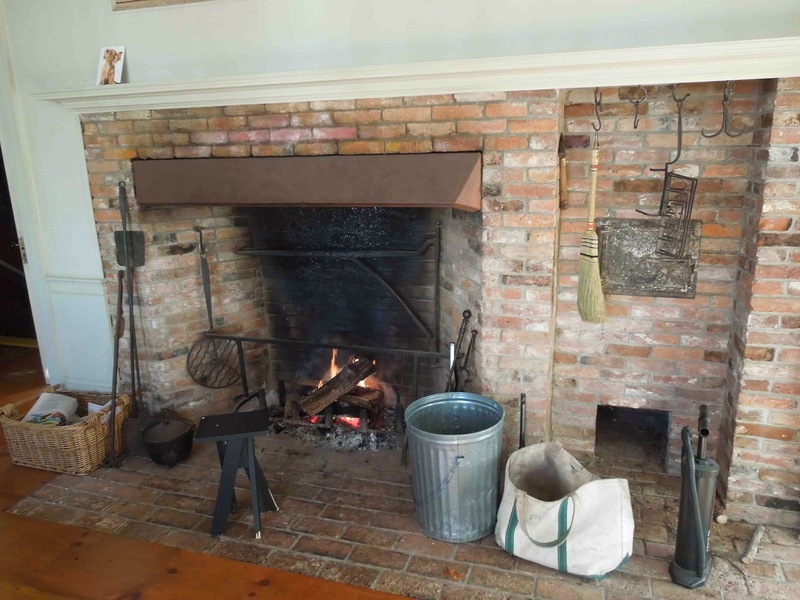 Maybe it's because of the house's character or history, but we immediately felt a connection. Even with its formalities, the rooms feel bright and airy, the atmosphere warm and humble, and the layout suitable for everyday life. Welcome! 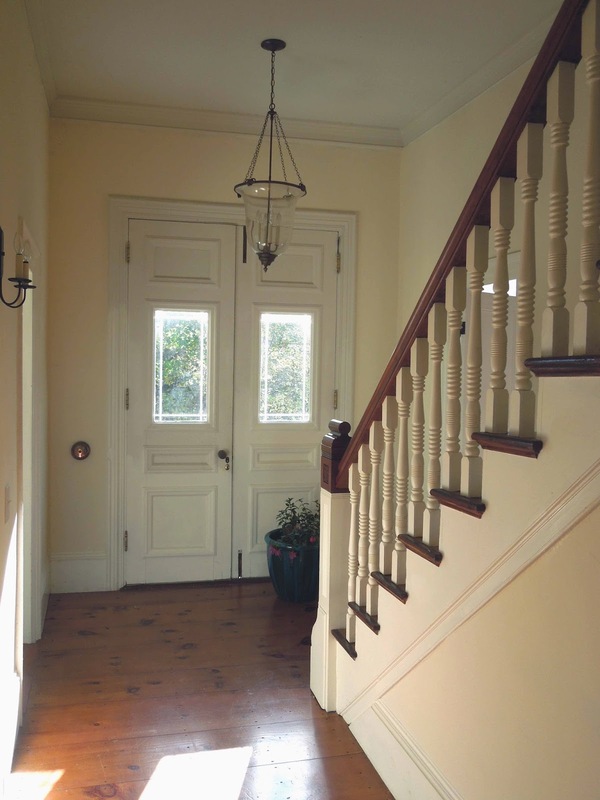 The French doors in the front date from the Victorian Era when the house was extensively renovated. 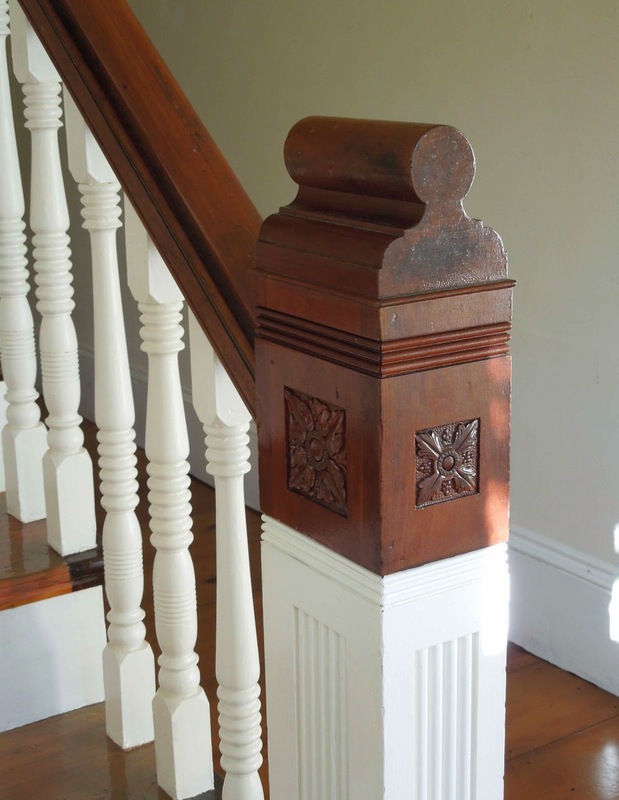 Also Victorian are the staircase newel posts, railings, and bobbin spindles. 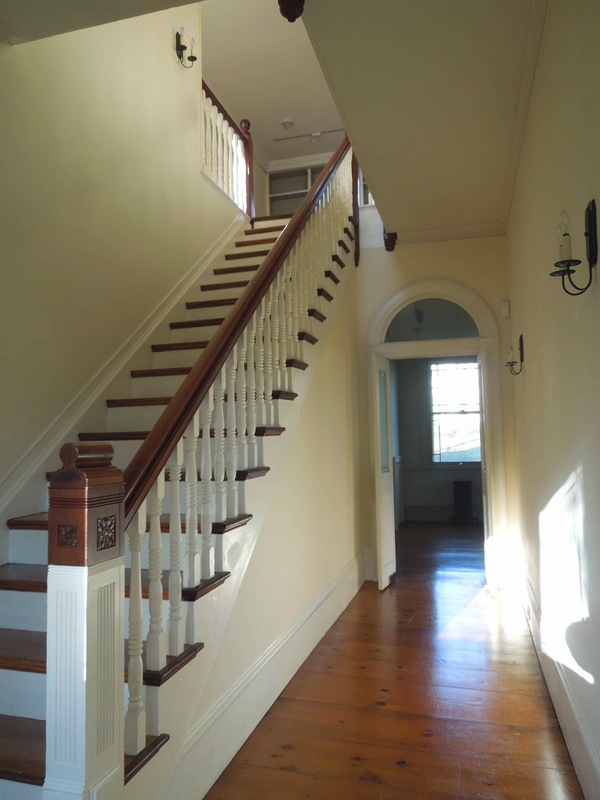 Upon entry, the dining room is immediately to the left; the foyer with staircase and long hall ahead; and the living room (below) is on the right. 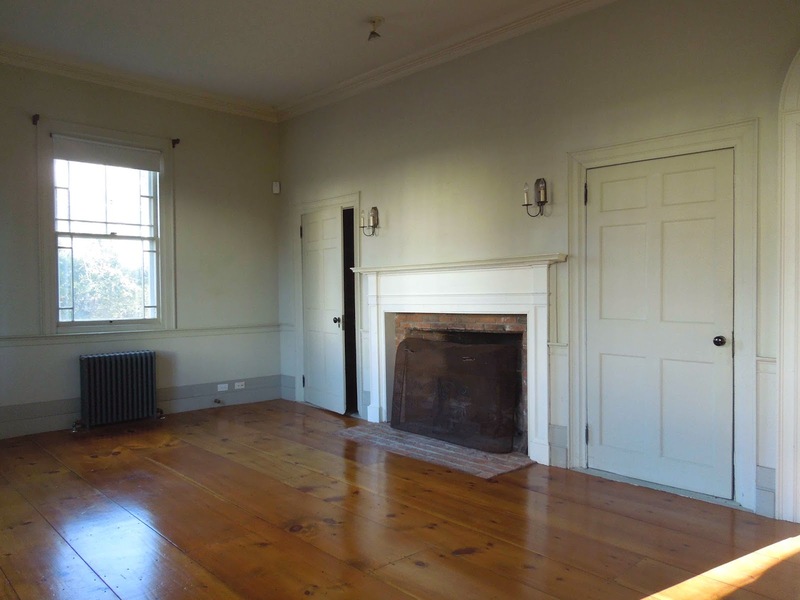 The living room is graced with bay windows, painted floorboards, built-ins, and the original mantel scraped to its early painted surface. 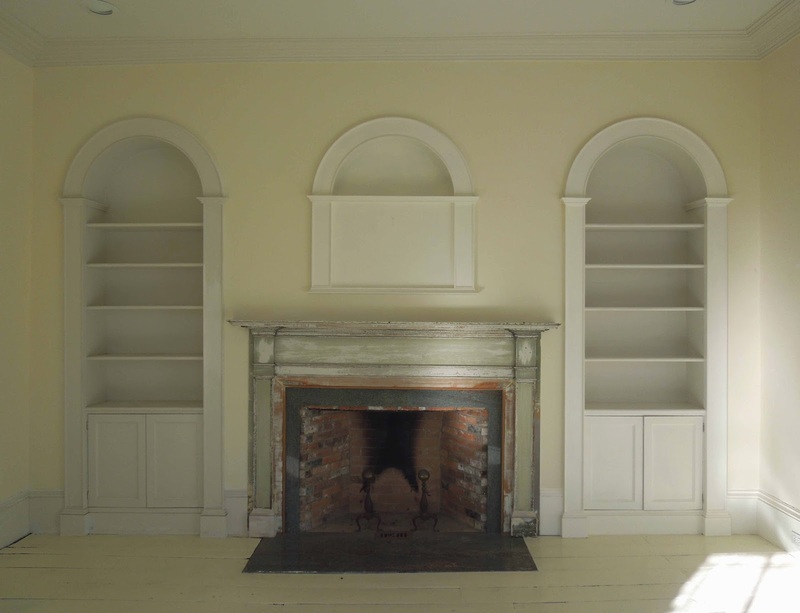 Arches on the fireplace wall were uncovered during a renovation, which led the previous owners to have these built-ins constructed. I think the ensemble looks overly embellished, so the middle display niche is coming out. 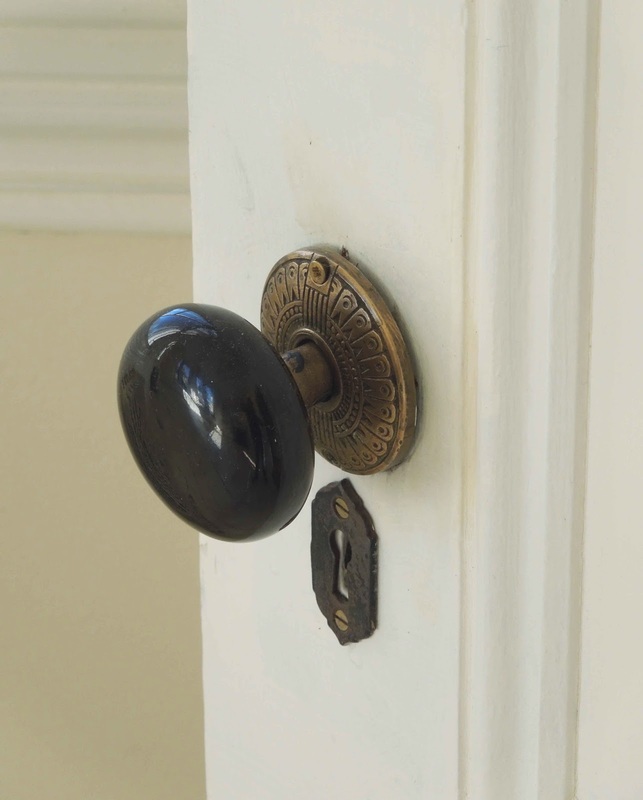 All the doors are appointed with either black or white porcelain door knobs and fanciful plates. Behind the living room is a more casual gathering area. This will be our family room for reading books, playing games, watching television, etc. 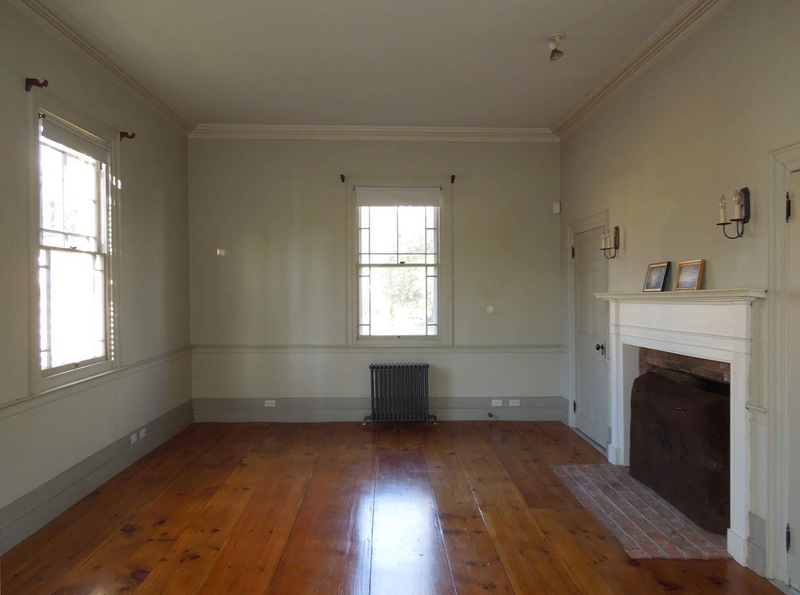 The very wide pine floorboards are not original. The kitchen, installed 10 years ago, is located in the addition. 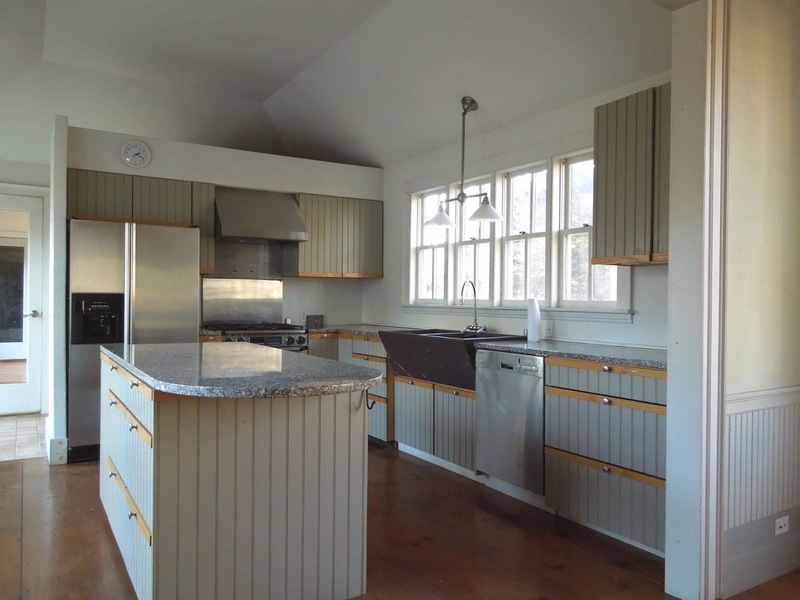 The beadboard cabinets will be repainted - they need it! From these photos everything looks deceptively clean, but trust me, not so in person. 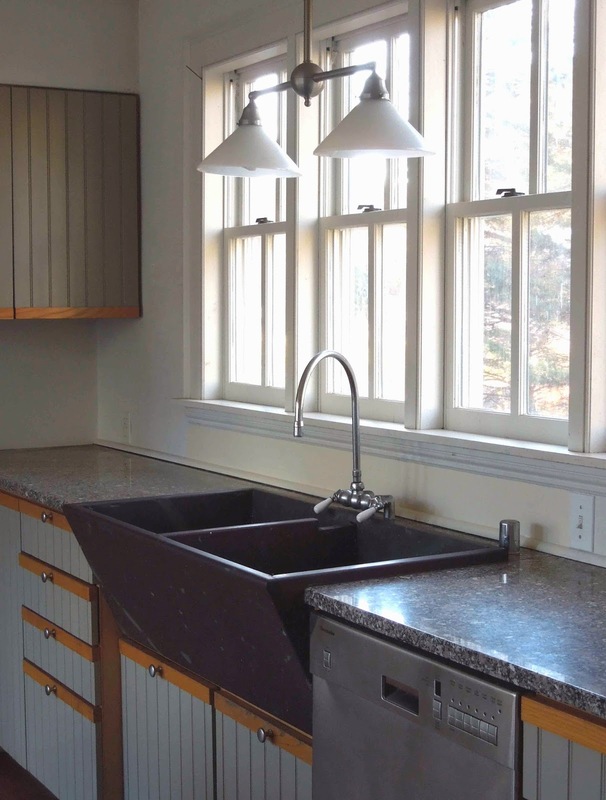 Since our dishwasher is broken, I look forward to hand washing dishes in this beautiful soapstone sink! 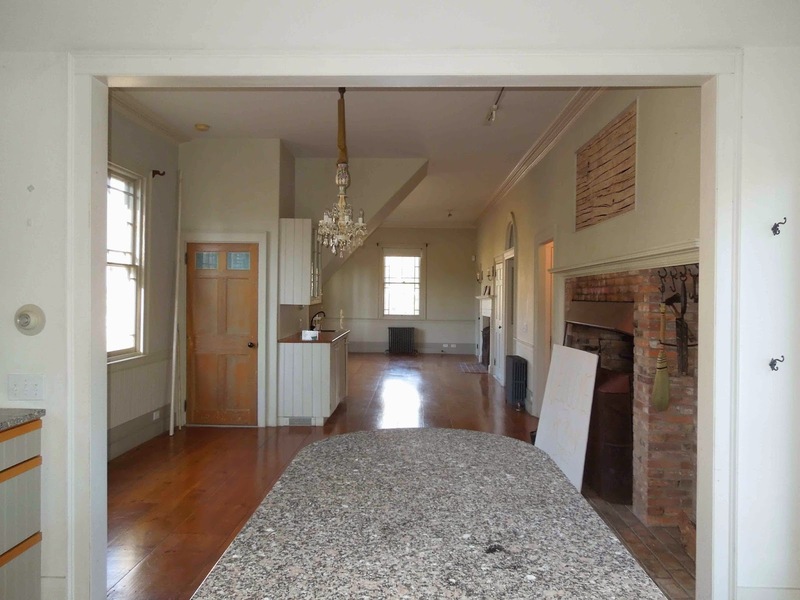 Here is a view to the original kitchen room with its brick cooking fireplace, back staircase concealed inside the closet, and family room at the end. What's this? Where's the staircase closet? 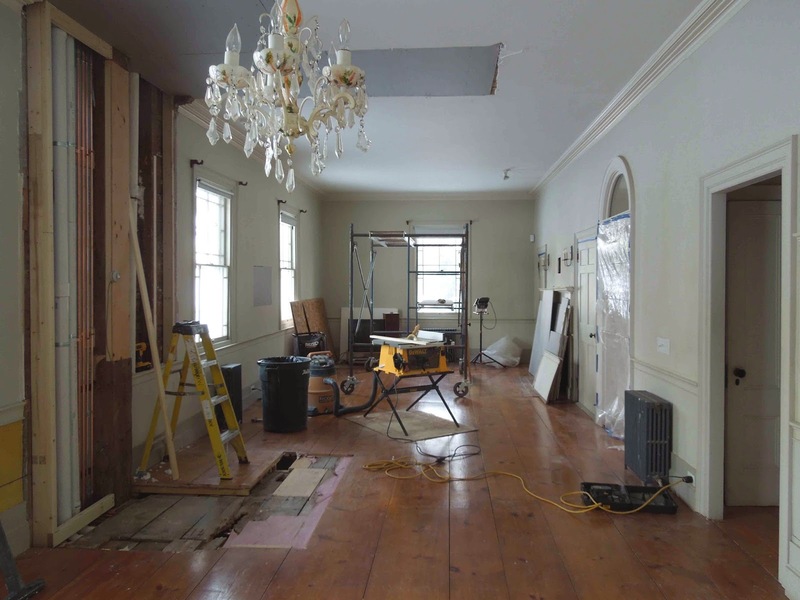 Since the staircase had been abandoned / covered over on the second floor, we decided to have it removed. This is our only renovation project, and we love it already. 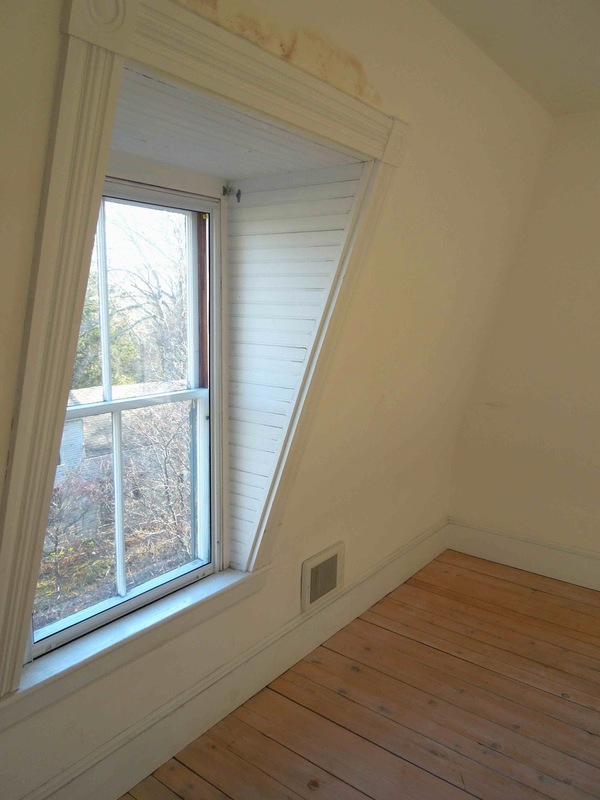 The view is now unobstructed - so open and airy! 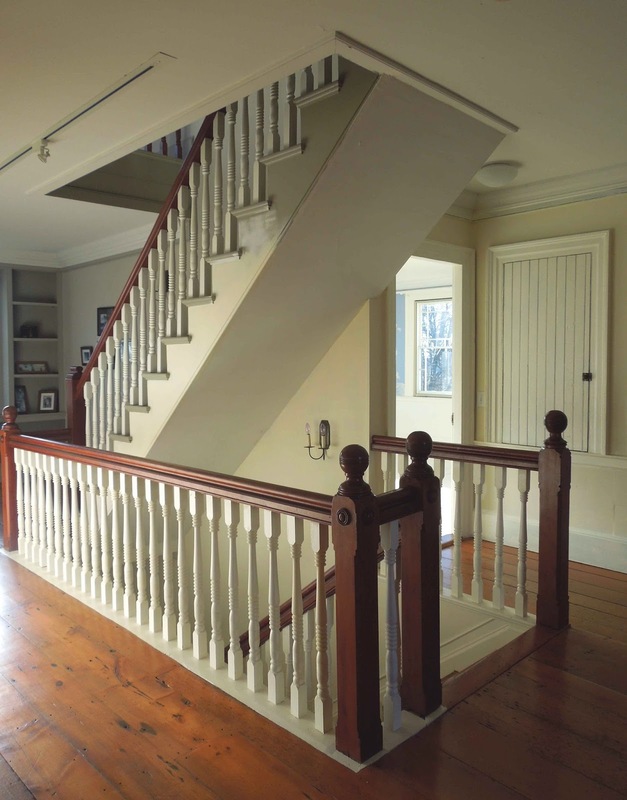 Let's go upstairs! More bobbin spindles - many more!! 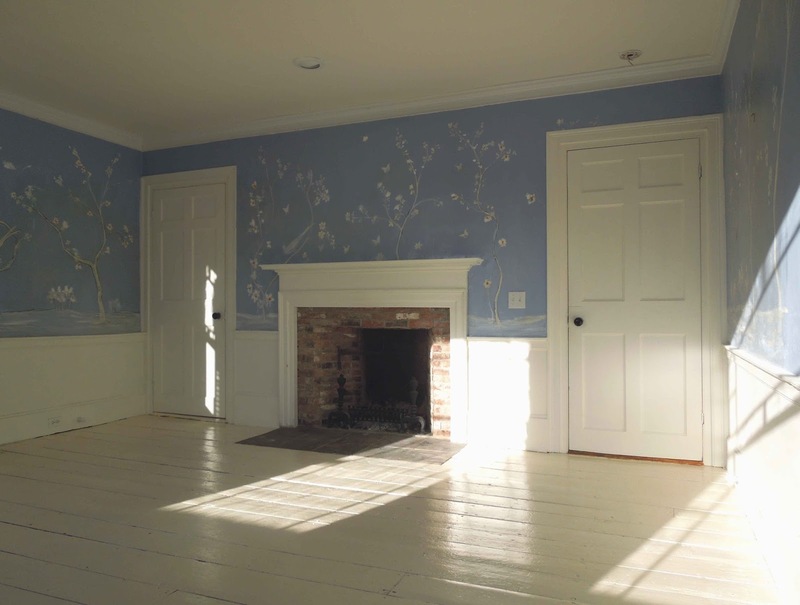 The lovely walls in this bedroom were hand painted in a Chinoiserie style by the previous owner's mother, who is an accomplished artist. 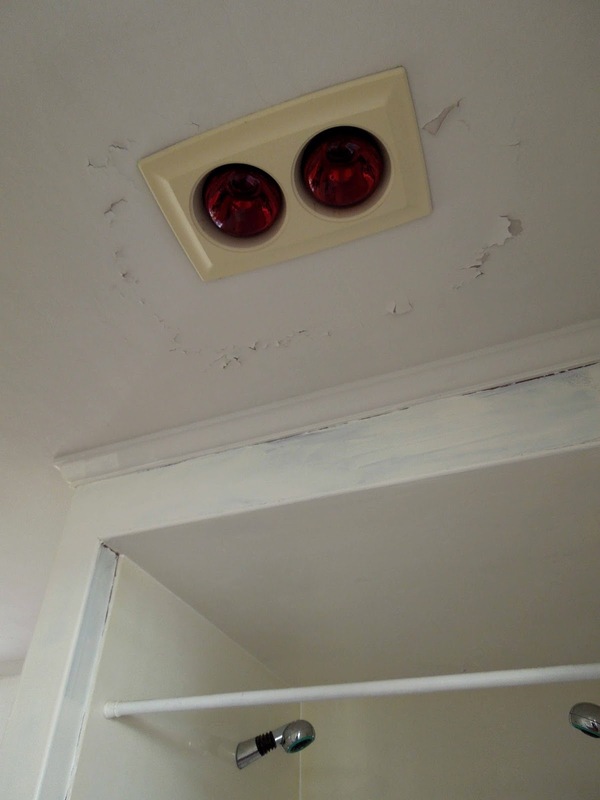 Due to damages and a multitude of issues, the walls have to be repainted, sadly. The good news is that the fireplace is functional - yay! 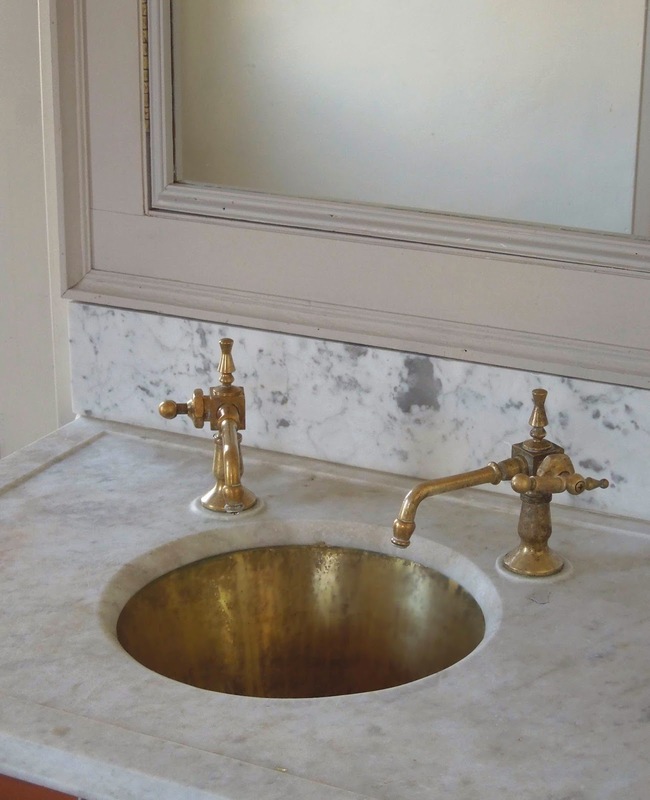 A bathroom with period brass fixtures and antique marble top. More photos, progress, paint colors plus rug selections to come. Now a bit of inspiration as well as objects I've been gathering. 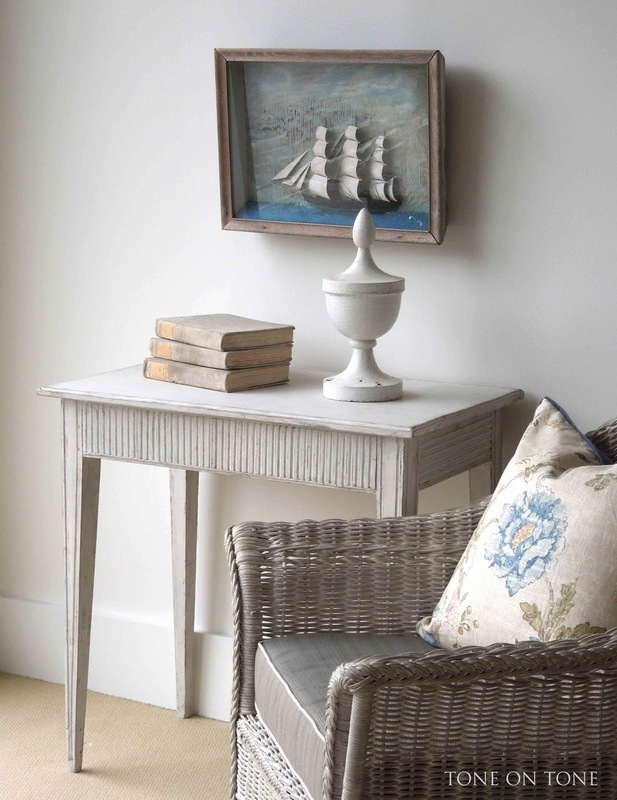 My goal is to create comfortable interiors in this historic coastal home - play down the formalities and keep it casual, but staying away from beachy. I want to pay tribute to Maine's rich maritime history, while not creating a theme park. And, I'm on the strictest budget! With their folksy charm, dioramas have always fascinated me. This glass-enclosed ship diorama was a steal for $175. (They usually start at $700-$1,000.) 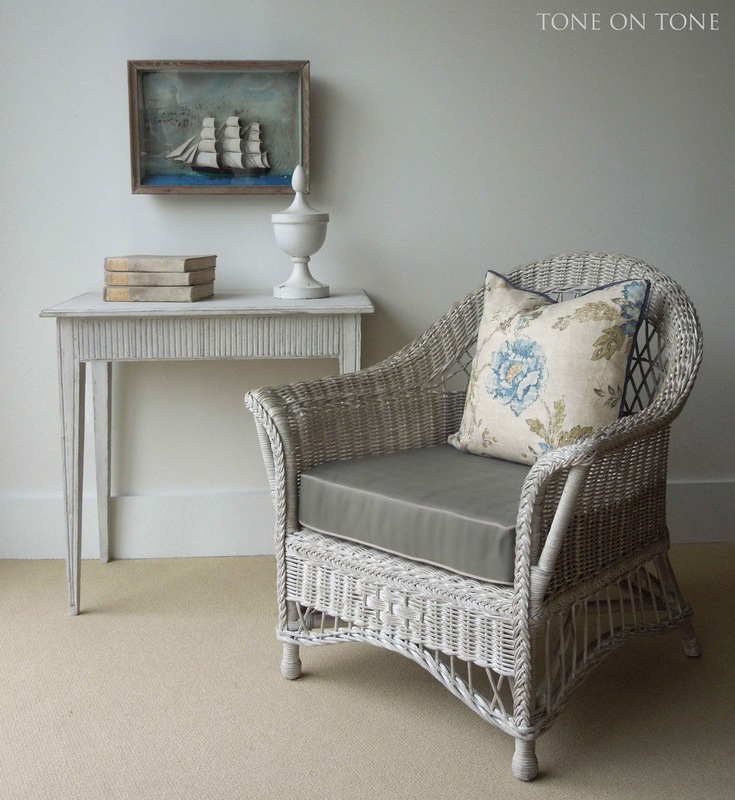 The paint is a bit flaky, which is perfect because I'm going for an old Maine look anyhow :) The whitewashed wicker chair was on sale at Arhaus. I like the updated proportions. 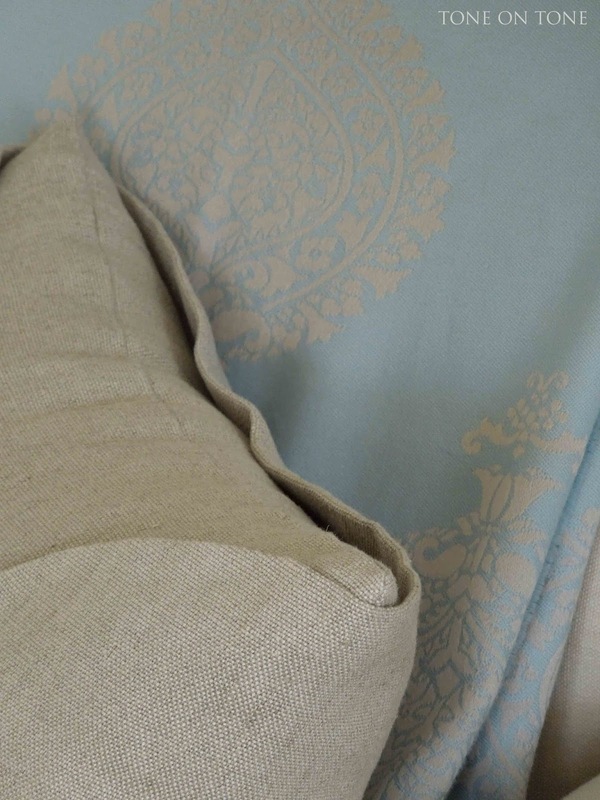 One day I'll splurge: change the stiff foam cushion to all down, and cover it in ticking. 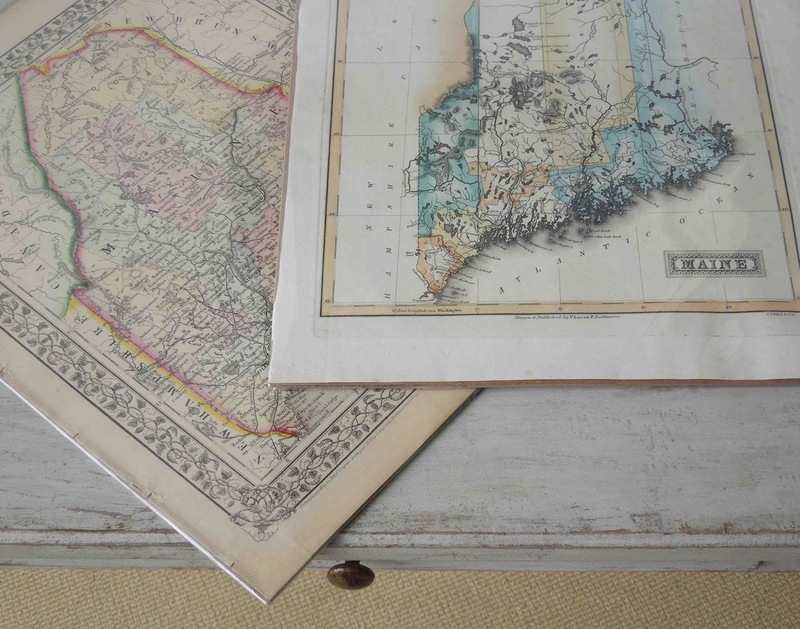 Starting a collection of vintage Maine maps for a gallery wall. If you have a source, please share! 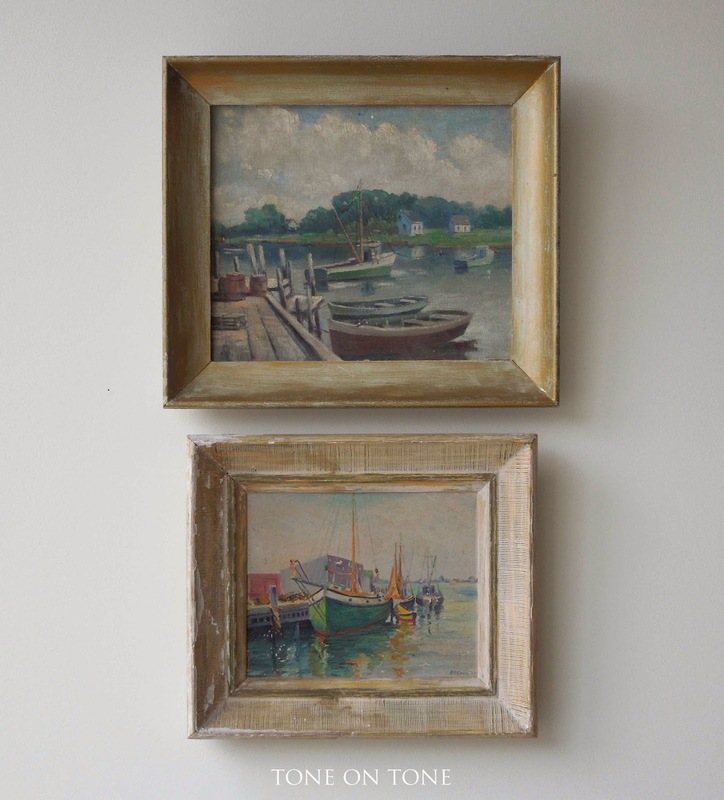 And some vintage local harbor paintings found in Southern Maine. I adore their grittiness and naivety. It's been terrific hearing from so many of you--old and new friends--regarding our tenth anniversary. Your support, encouragement and enthusiasm are all greatly appreciated. Many thanks! I have another anniversary coming up. In February, I'll be entering my third year of blogging. Gosh, how time flies :) I still have plenty to say and lots to share, so please stay tuned. 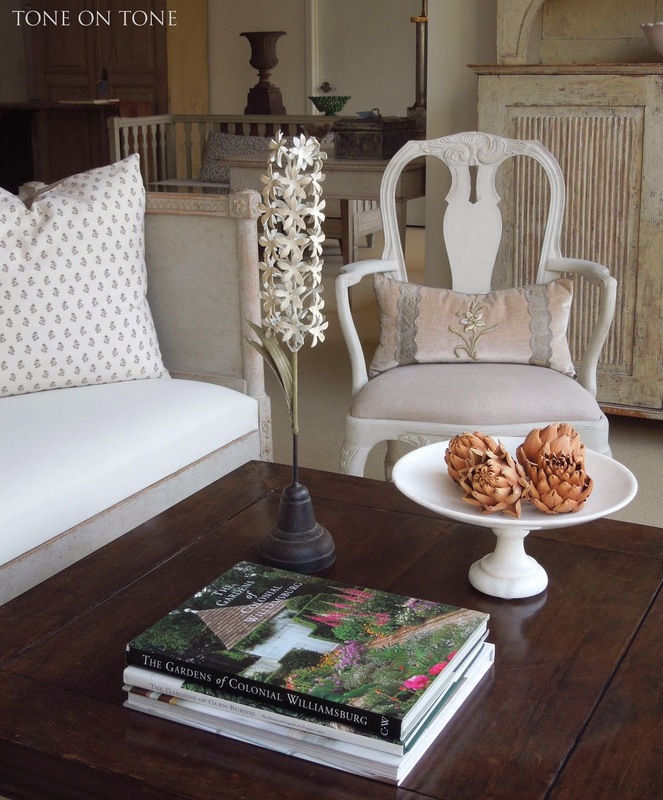 One goal for 2014 is to showcase more client homes and feature works of my designer friends. In the two years of writing this blog, I have formed wonderful friendships with other blog authors - modern day pen pals across the globe. Some major talents out there! Generous, too!! Speaking of which, I recently won a couple of giveaways which I'm delighted to share. 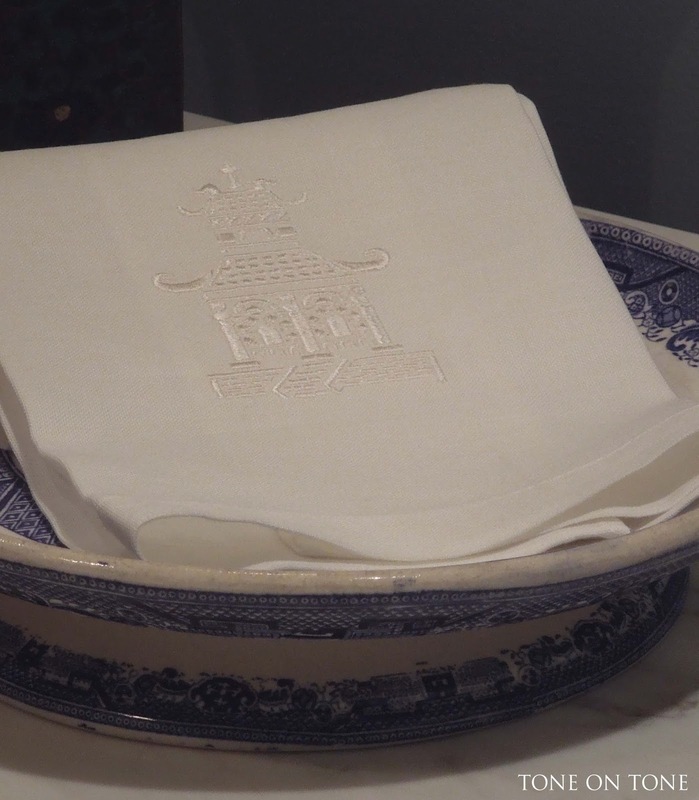 First up is this fine white-on-white linen hand towel with an embroidered pagoda - so divine! It is from Teresa Hatfield's shop. Teresa is the author of the stylish blog: Splendid Sass. Thank you, Teresa! 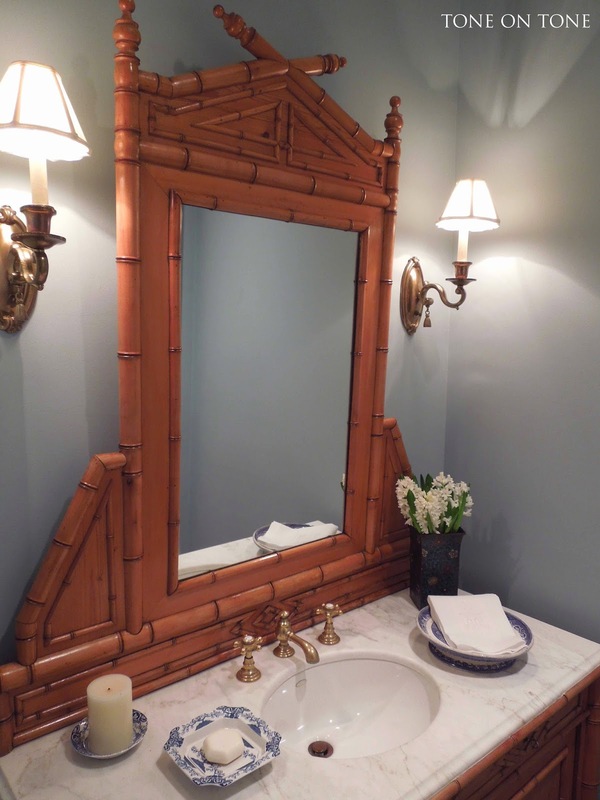 To properly show this towel, I asked my dear friend, Gail, to let me photograph it in her Chinoiserie style powder room. Thanks, Gail! 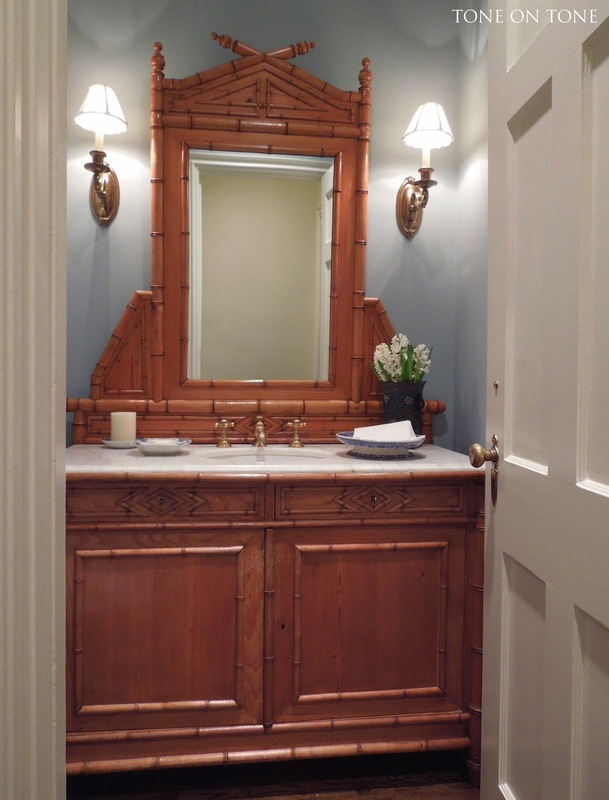 When Gail renovated her home 15 years ago, she converted an antique French faux-bamboo pine washstand into a powder room sink. The brass fixtures have aged beautifully. 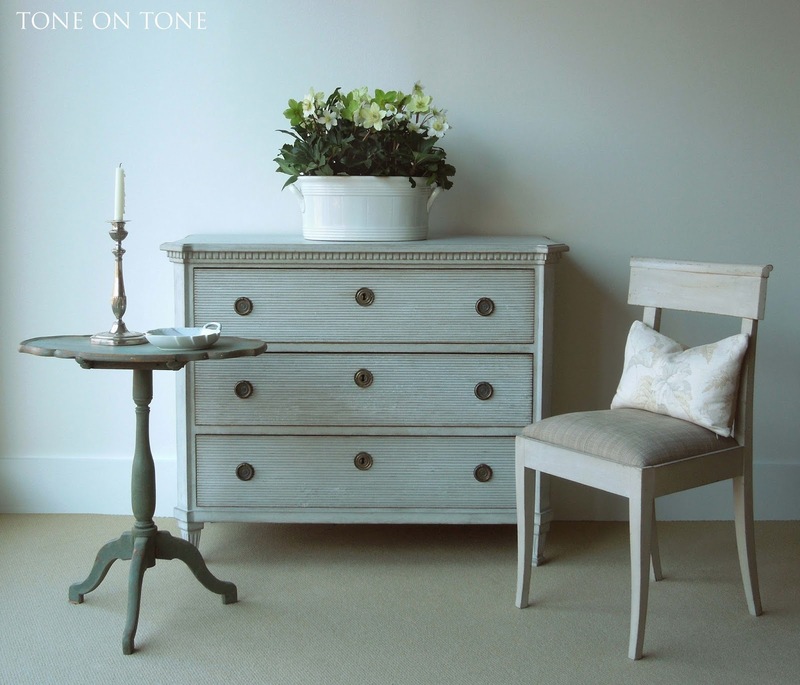 Paint color is Benjamin Moore's Paradiso #717 - a saturated blue-gray with a tinge of green to keep it from going cold. 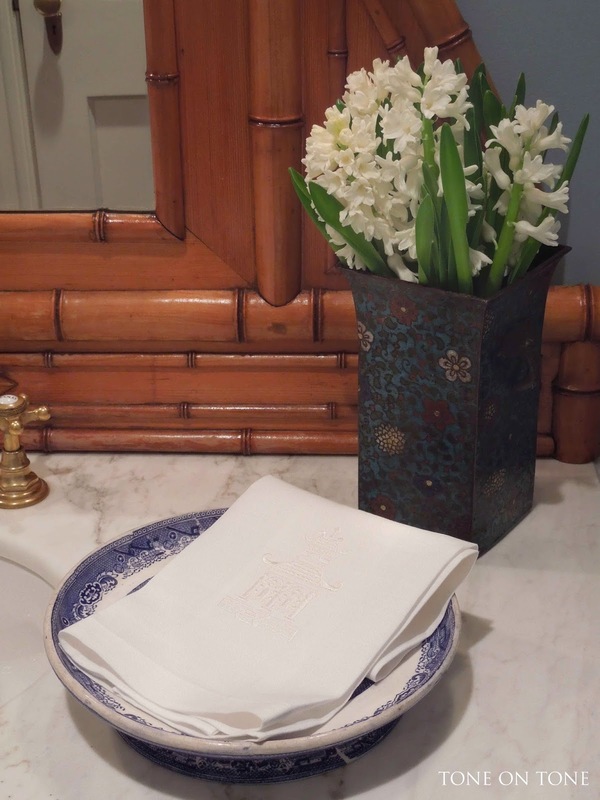 Isn't this hand towel perfect in Gail's powder room? 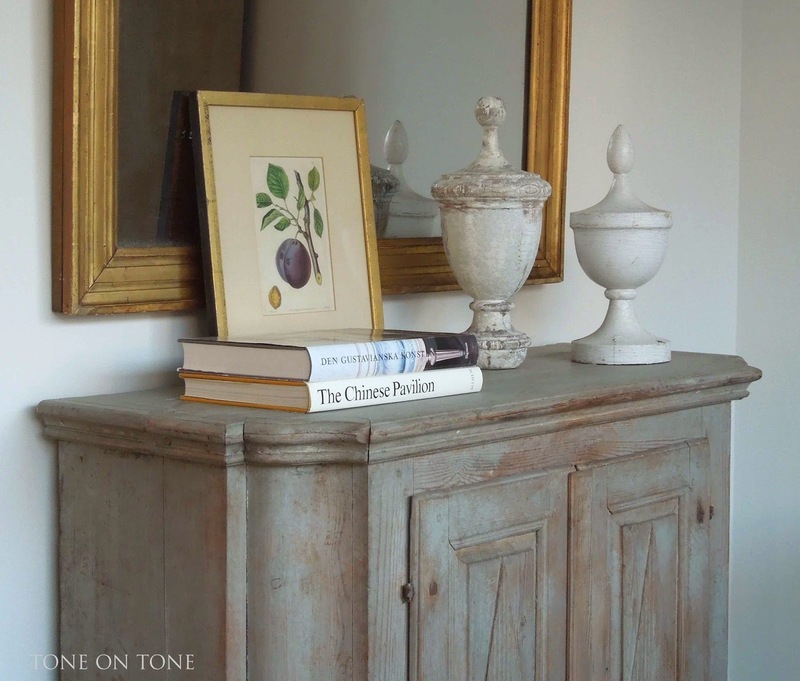 The antique Blue Willow cheese stand, from Tone on Tone, makes a great towel tray. In addition to the pagoda, Teresa has many other hand towels in fabulous and fun designs - see them here. 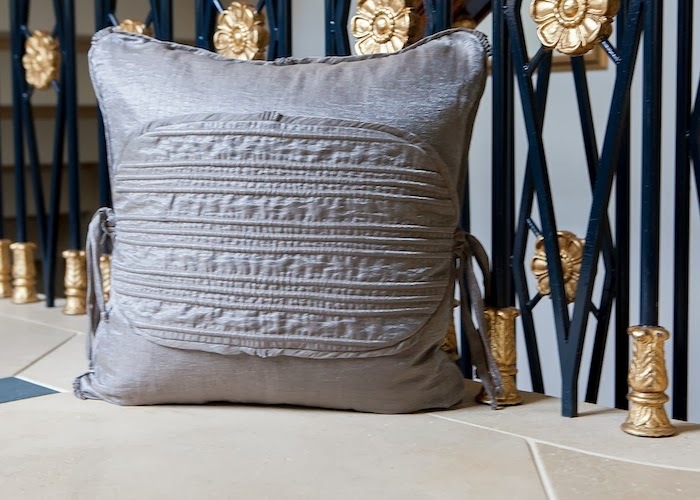 Here is a gorgeous couture pillow from Horsley Kaufman. I want to thank Holly Street from Things That Inspire for hosting such a special giveaway. Holly's posts are always beautiful, informative and thoughtfully researched. 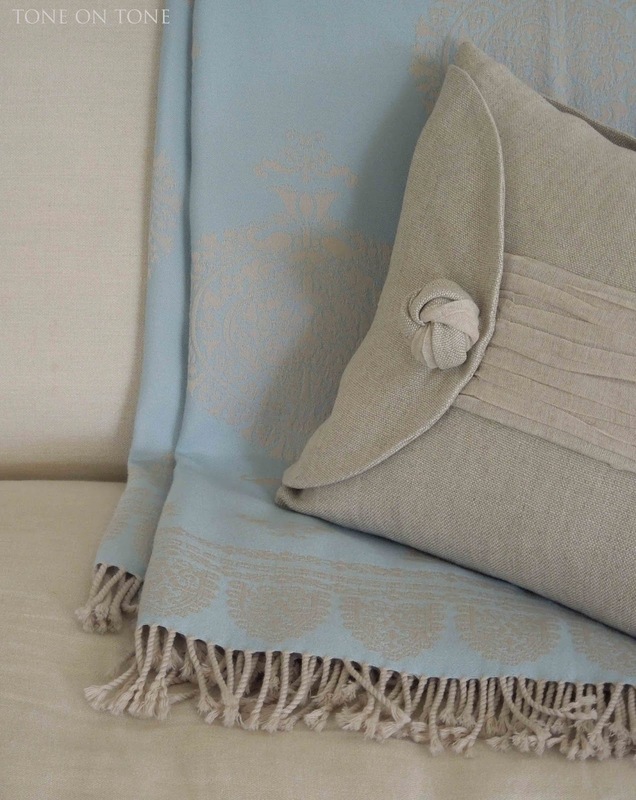 Holly also has an online shop, Quatrefoil Design, of wonderfully curated art, accessories and jewelry. And of course, warm thanks to Linda Horsley and Margaret Kaufman for their generosity. 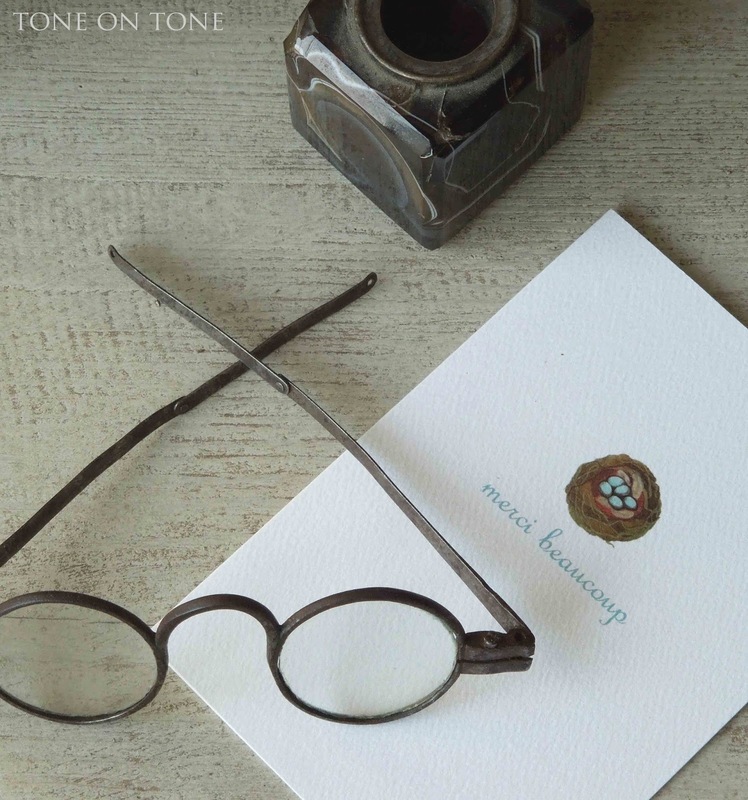 Each piece in the Horsley Kaufman collection is an original work of art. I wish you can see the exquisite craftsmanship in person - the detail is incredible! 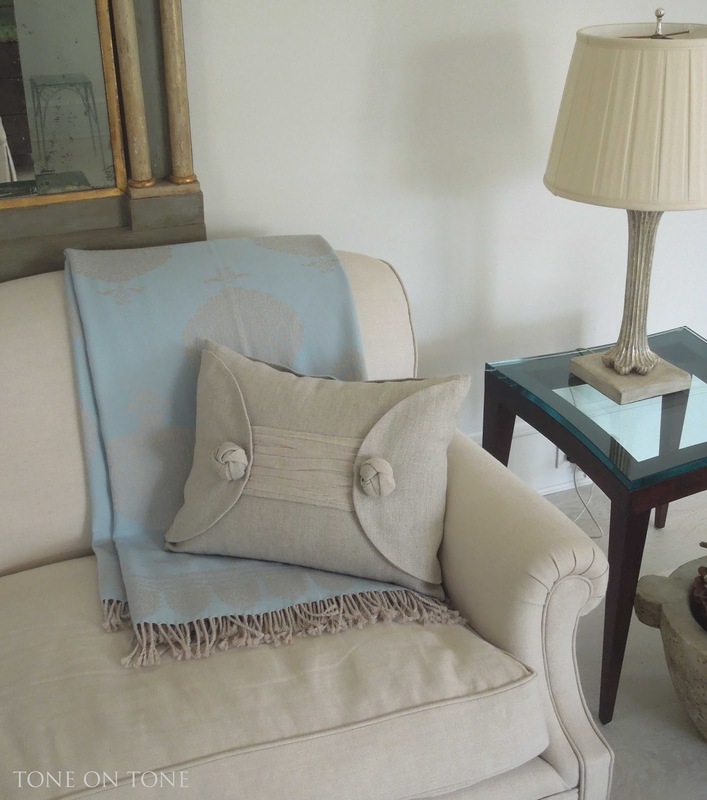 There are many more beautiful pillows, such as these, from Horsley Kaufman's website: Photos from HK. 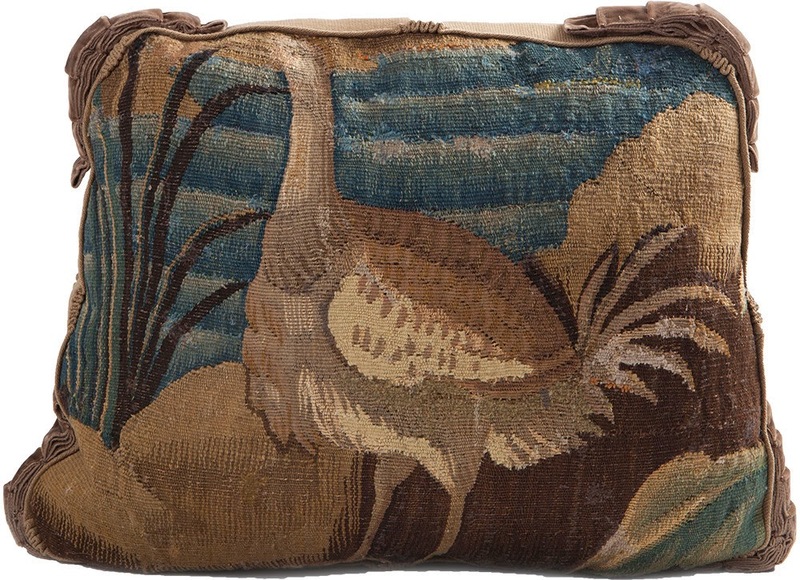 I absolutely love this magnificent pillow incorporating a fragment of 18th century bird tapestry. I'm also enjoying some lovely garden books courtesy of Elizabeth, Lori, and Michele!!! Thank you all for the garden inspirations. I can hardly wait for spring! 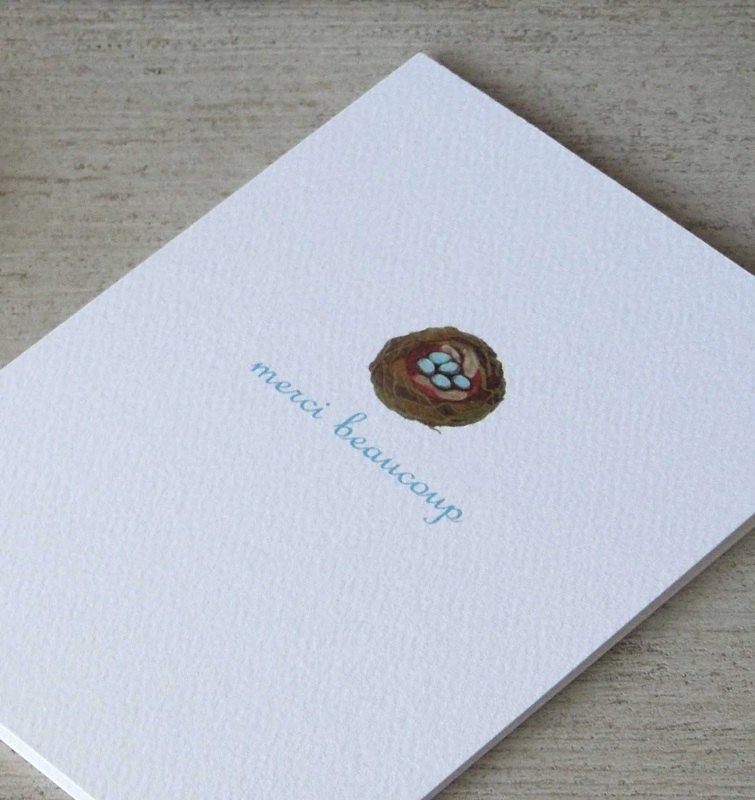 Sending everyone a big merci beaucoup on this charming note card from Linsey! 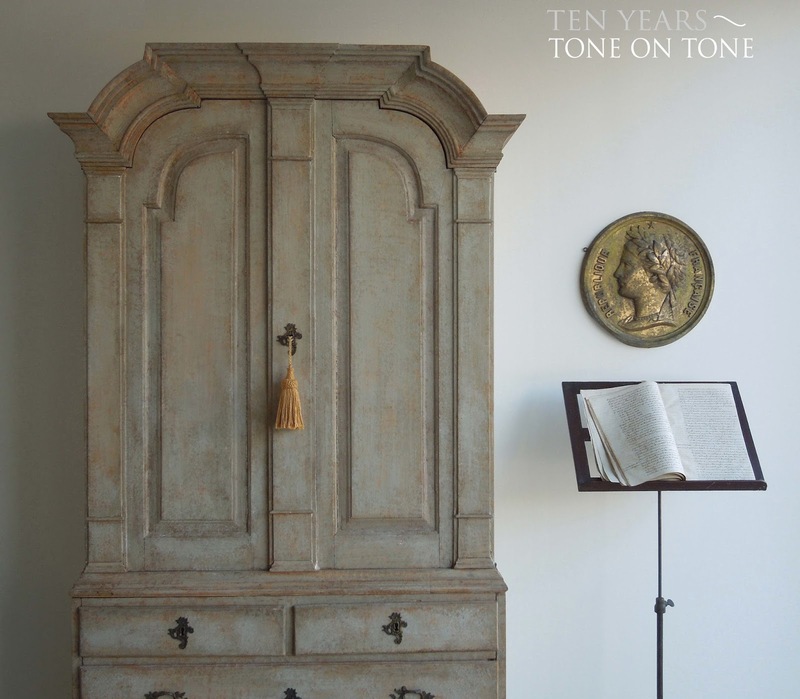 Celebrating Ten Years at Tone on Tone! 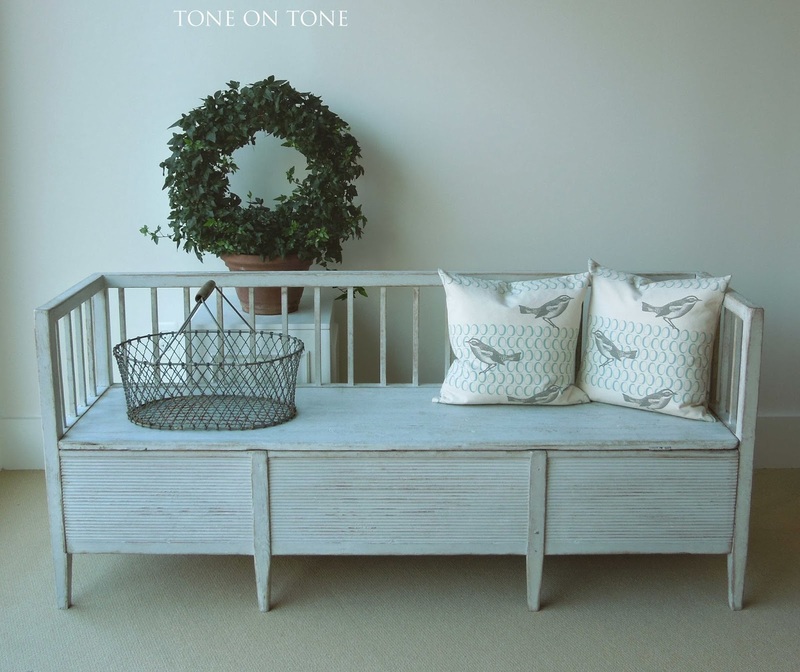 10 years ago, Tom and I signed a lease for a small shop and, within a couple months, opened Tone on Tone. Prior to that, we were accumulating inventory in the basement of our home, which by the way flooded while we were on a buying trip. Not a pleasant way to start a business. Our little shop seemed perfect with bright sunshine, an open floor plan, lofty ceilings, and endless walls for artwork, mirrors, and such. But within a year we had to move due to complications with the rock-and-roll studio later opening next door - imagine antique mirrors and crystal chandeliers shaking from the vibrations! A much larger retail space became available, and with much hesitation, a move across the street to our current location became the best option. Here we were just a year old, maxed out on a small business loan, stationary and signage barely dried, and having to tackle the additional square footage - talk about stress! Fast forward to the recession a few years later - a most difficult time for all. Thank goodness for our loyal and encouraging clients - you all are awesome! Would we do it all over again? Yes! Absolutely!! Though design trends change, our point of view has remained true due to the continued interest and passion of our clients. Tom and I have become good friends with many of you - thanks for your kindness and support. We appreciate you finding homes for our treasures. Over the next few months, I will be sharing more of our journey to 10, including highlights and reflections. 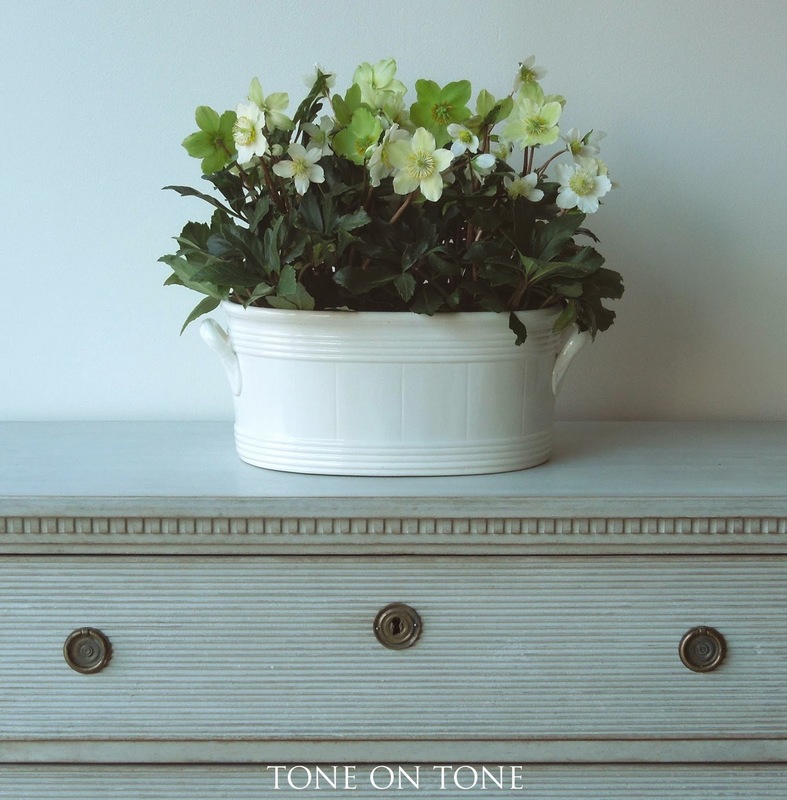 And even a couple of giveaways to fete a decade of Tone on Tone. In the meantime, please enjoy this preview of the newest shipment at the shop. For this first shipment of 2014, we traveled back to our beginnings in Sweden. 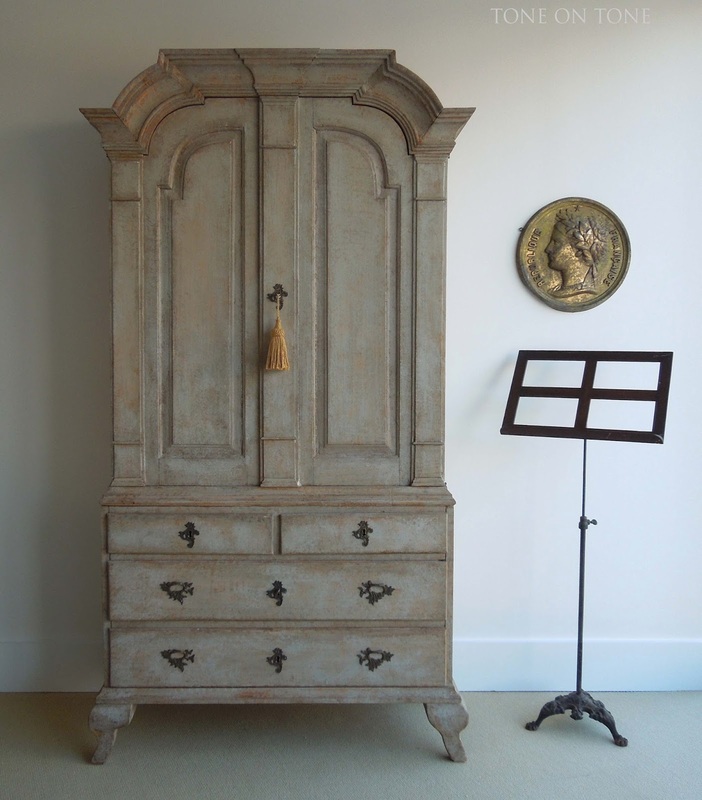 A splendid 18th century Rococo cabinet with old and new painted surface. It can hold books, china, clothing, and even a TV with the shelves removed. 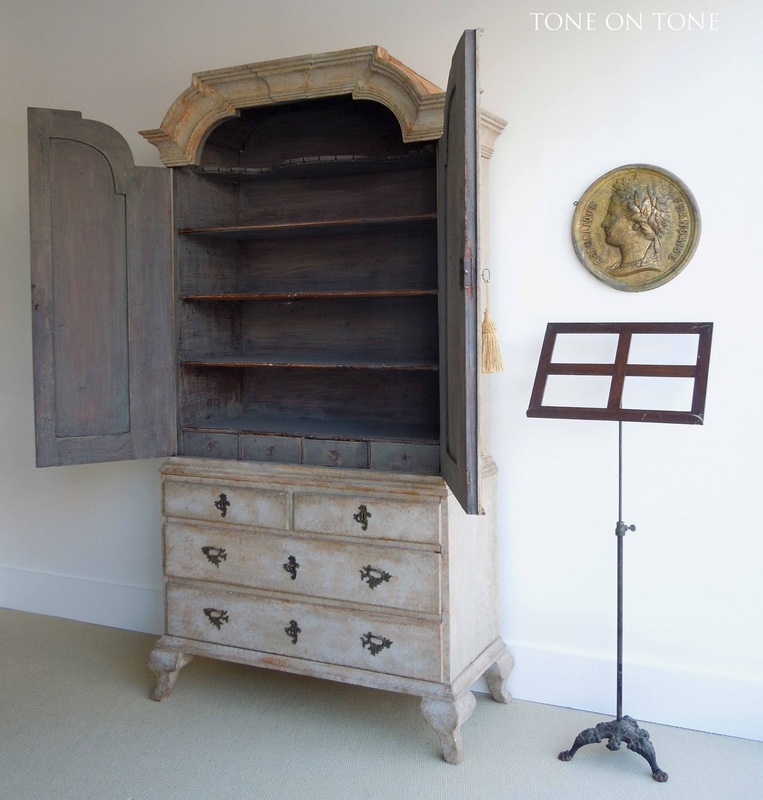 A classical style French plaque hangs above an English wood and iron music stand. 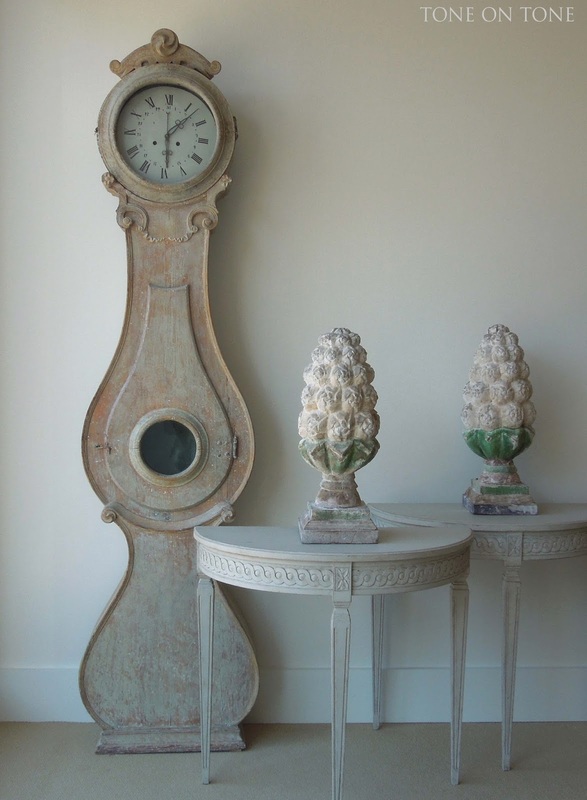 This vignette features a pair of old painted wooden finials, small and elegantly carved Gustavian style demi-lune consoles, and a Swedish clock scraped to original paint. 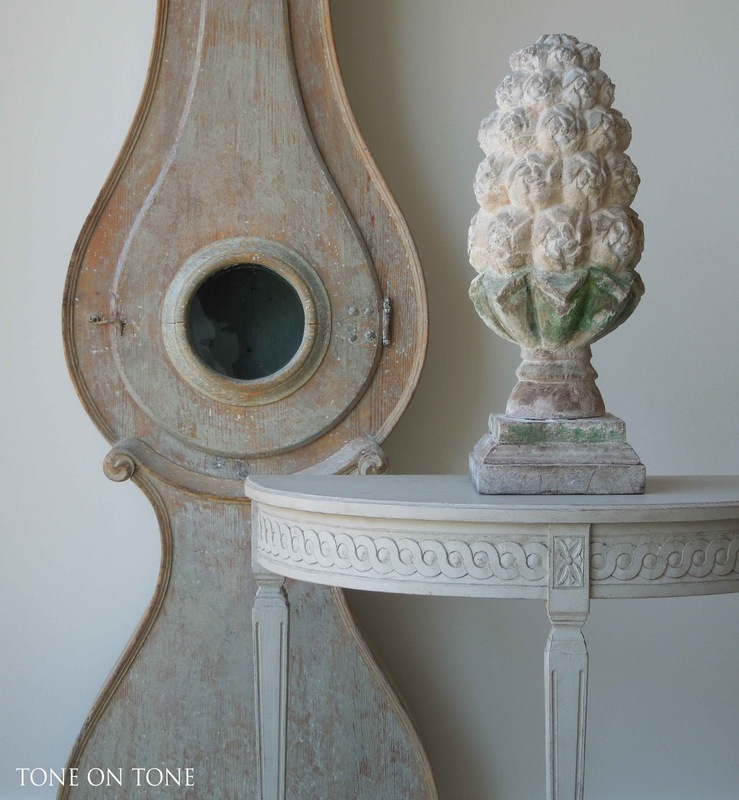 A couple more wooden finials with old white paint. 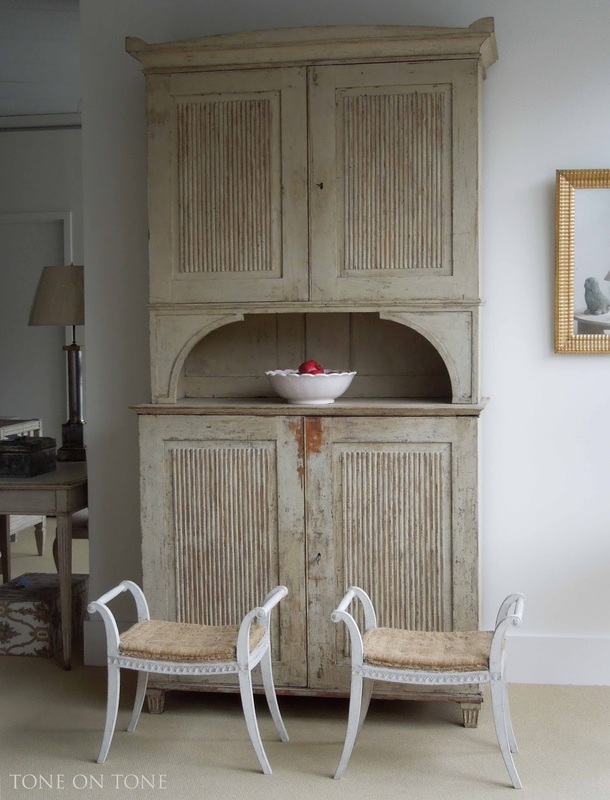 We love Swedish painted settees, and this one with storage beneath the lift-top seat is perfect for the entry hall or mudroom. It is only 20" deep. In this shipment are many Swedish tables. 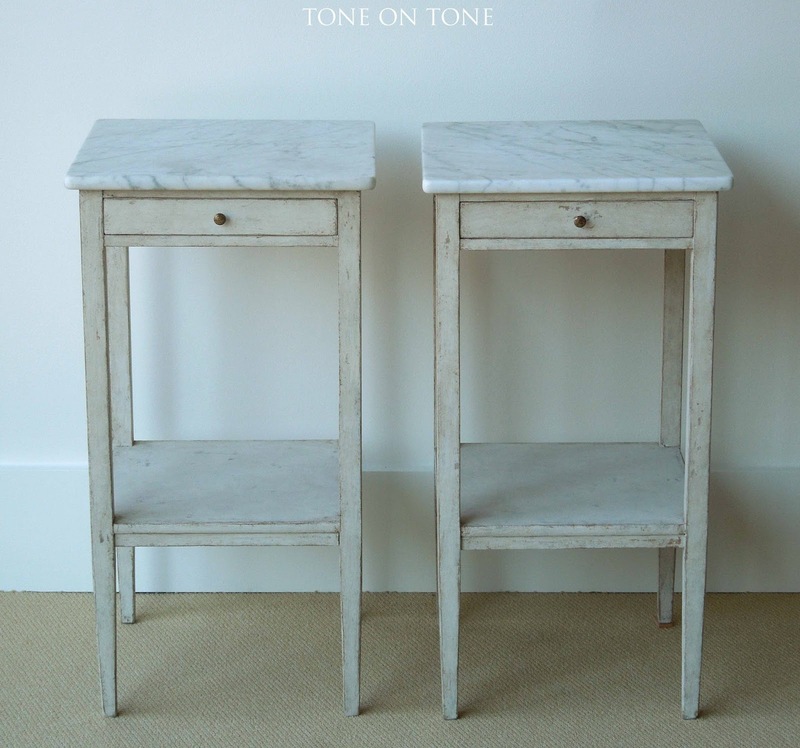 This petite pair offers a marble top, drawer, and shelf. Great for a bedroom! 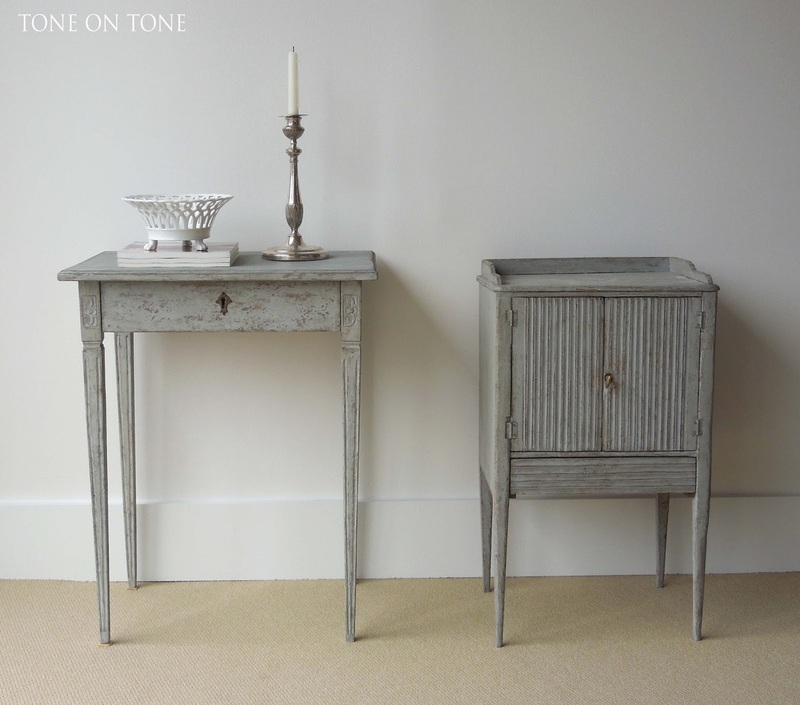 Two matched tables (available separately) from the early - mid 1800s. 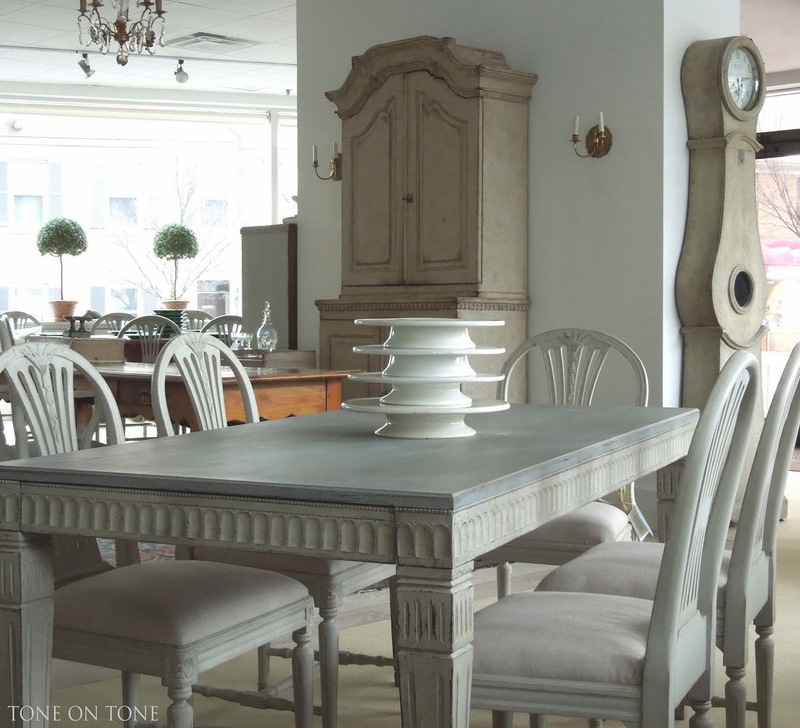 Their elegant lines and humble spirit define classic Swedish style. 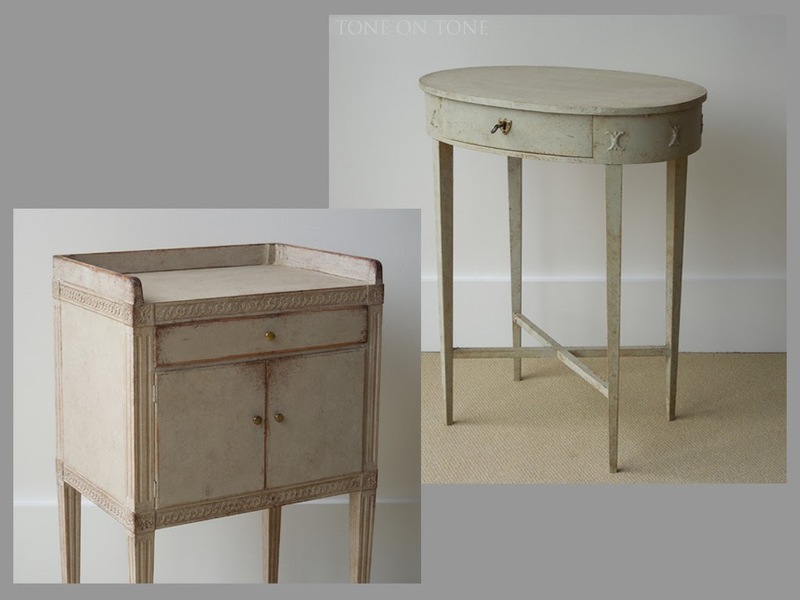 The nightstand has a charming gallery top and blind drawer below the doors. 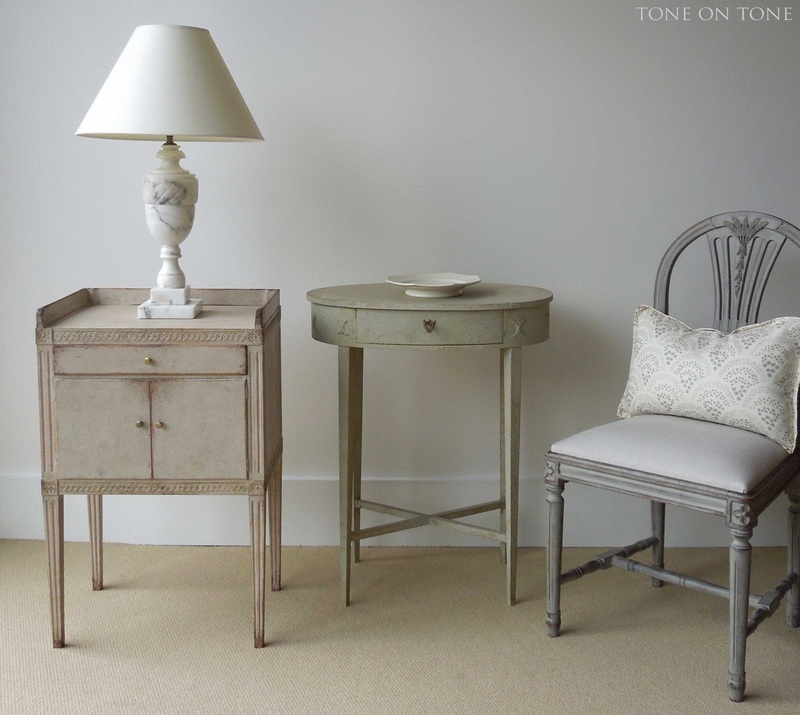 Another matched pair of tables. These date from the 1900s. 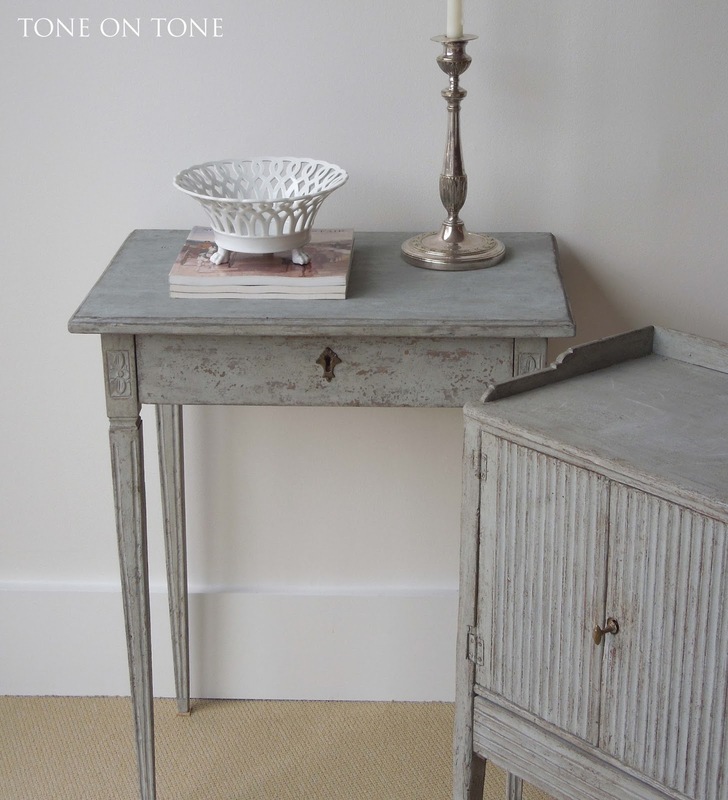 The oval work table is fitted with small compartments inside. 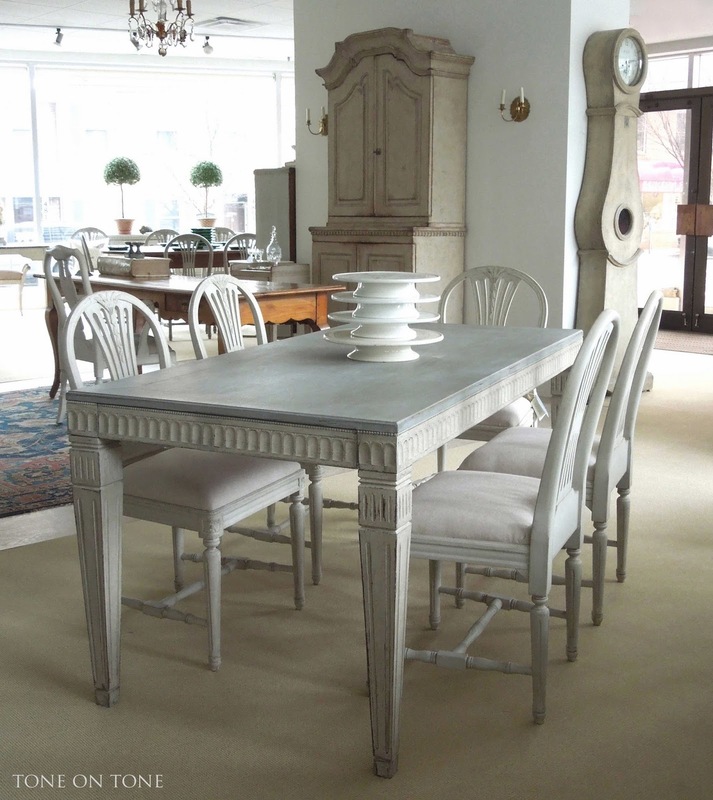 Here is an early Austrian brass mounted fruitwood table with fluting / stop fluting, graduated drawers, and slender legs. 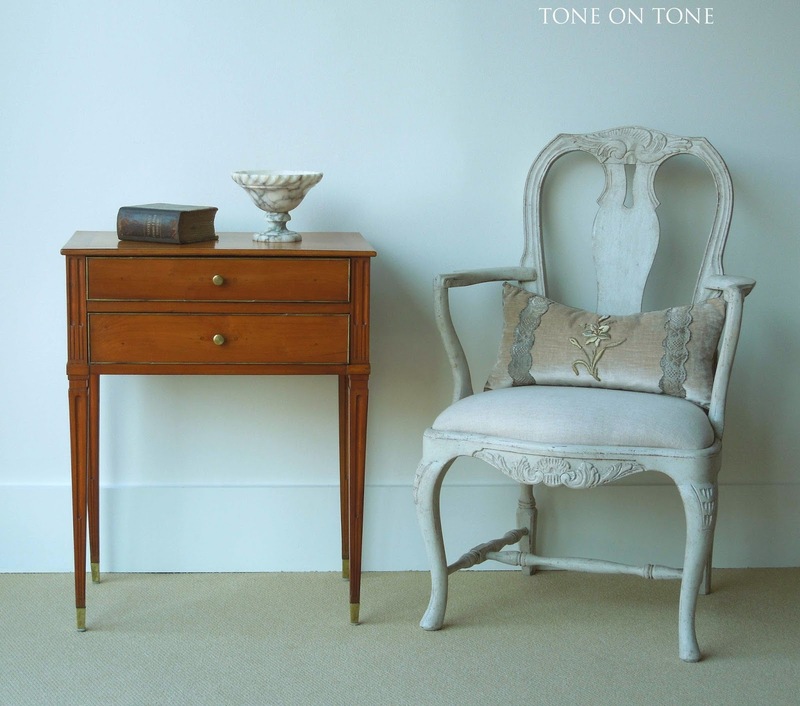 The curvy Swedish Rococo style armchair provides a lovely contrast. 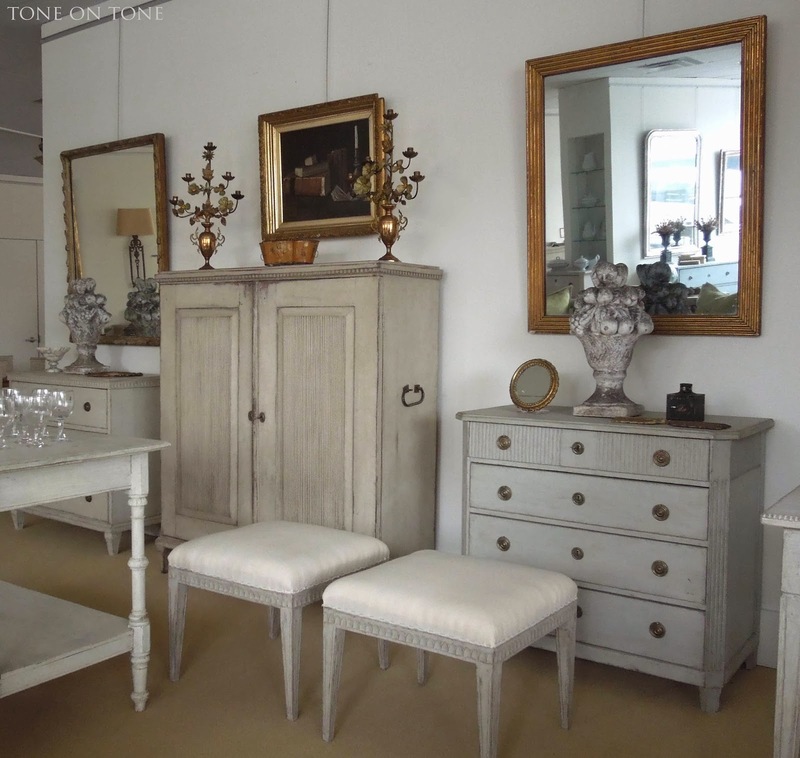 This Gustavian period (Ca. 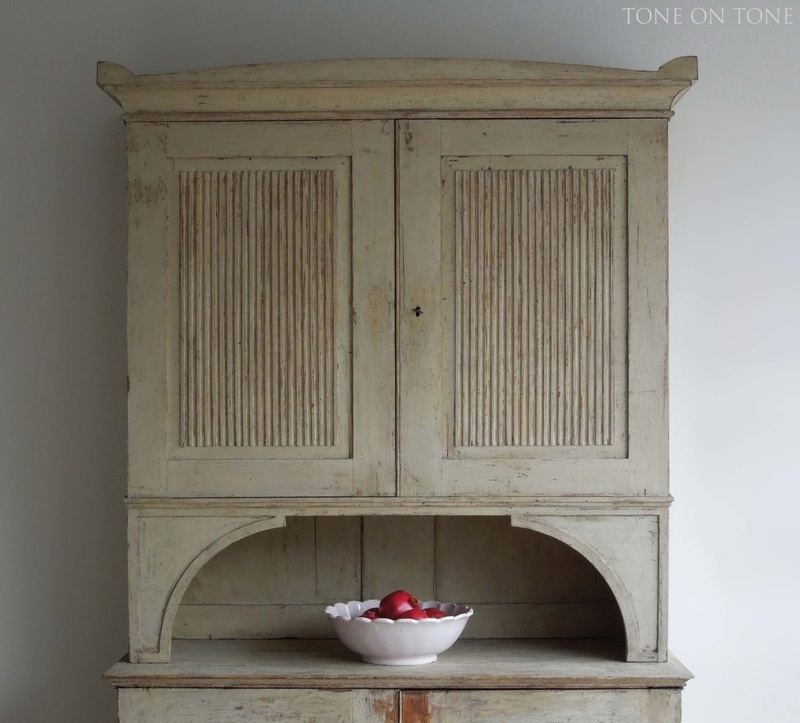 1790s) stepback cabinet with shaped cornice, peaked corners, raised panel doors with reeding, and arched niche has an exquisite patina of early paint. 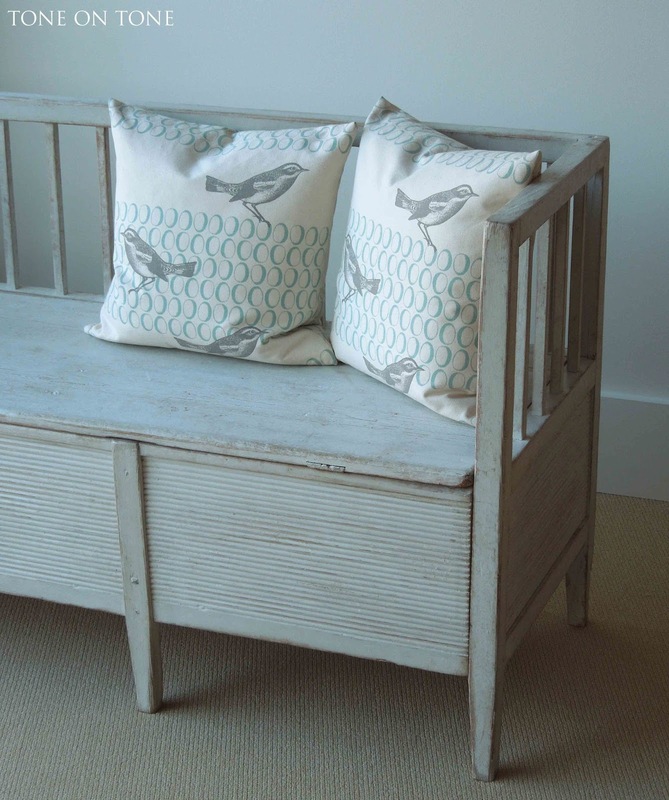 The pair of window stools retain their old jute seats. 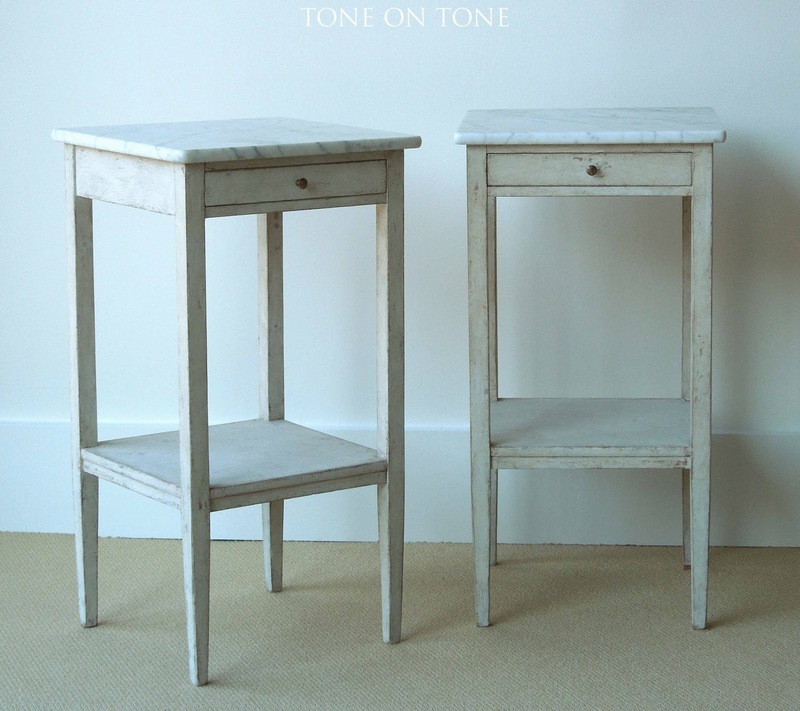 These airy and sculptural stools would look smart in front of the fireplace or flanking a hall chest. 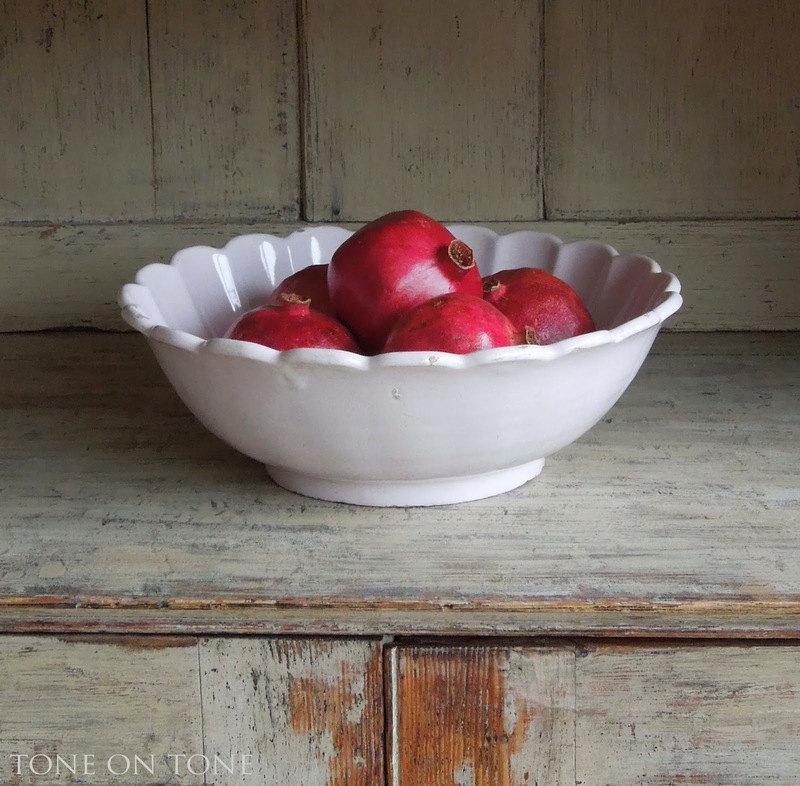 Winter arrangements with antique French pottery: pomegranates in faience bowl and hellebores in ironstone footbath. 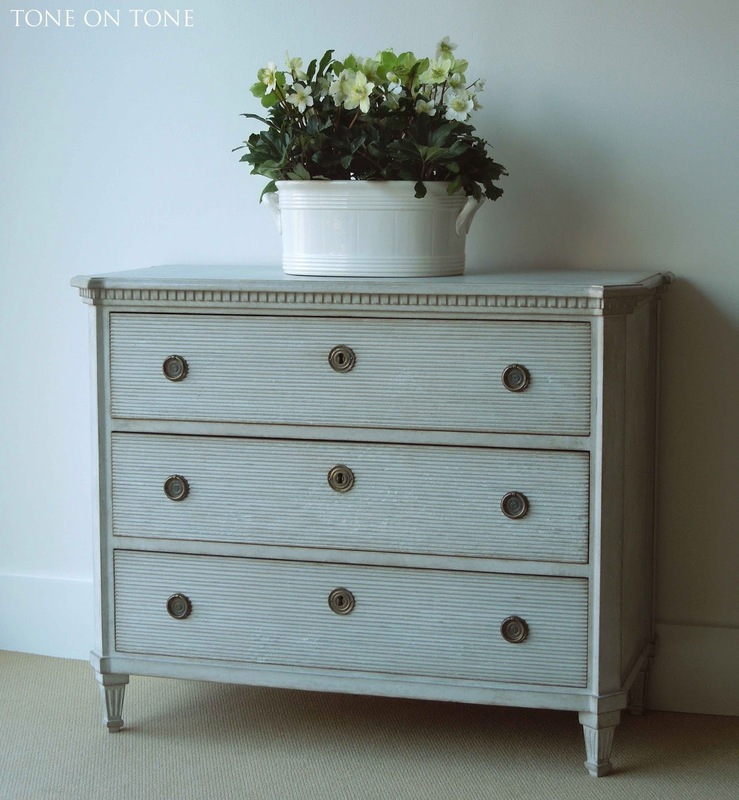 Also in the shipment are many case pieces such as this Swedish chest. 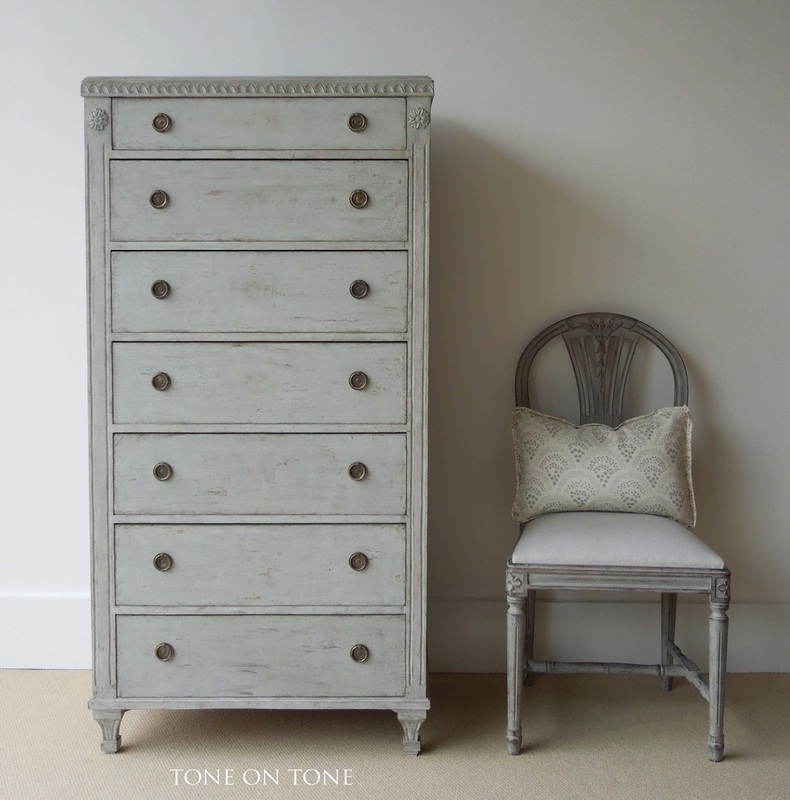 With outset corners, canted front, dentil molding and reeding, this is the quintessential Gustavian chest! 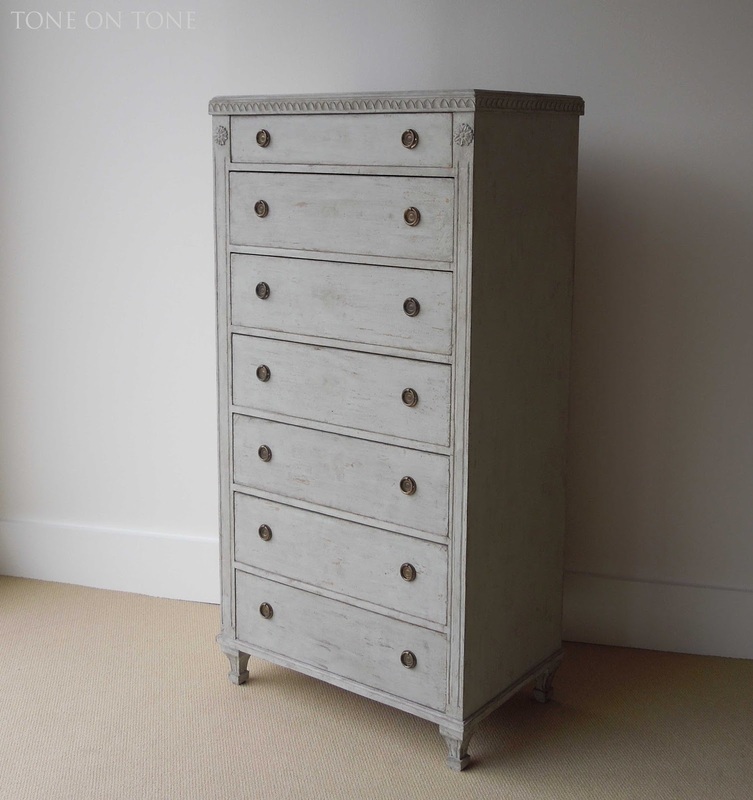 This semanier tall chest has seven drawers - one for each day of the week! It's not a piece frequently found in Sweden. 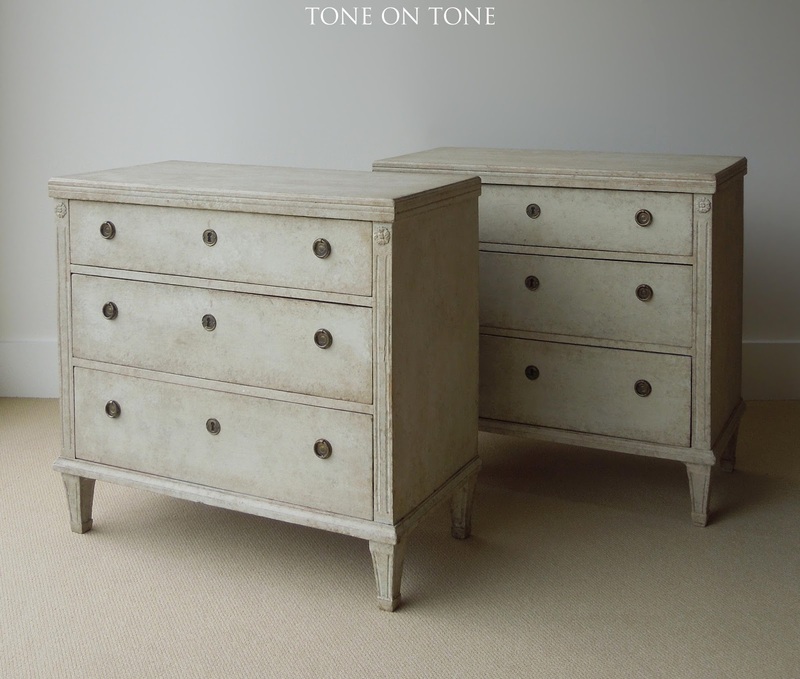 Notice the graduated drawers on this pair of Gustavian style chests from the 1890 - 1900s. 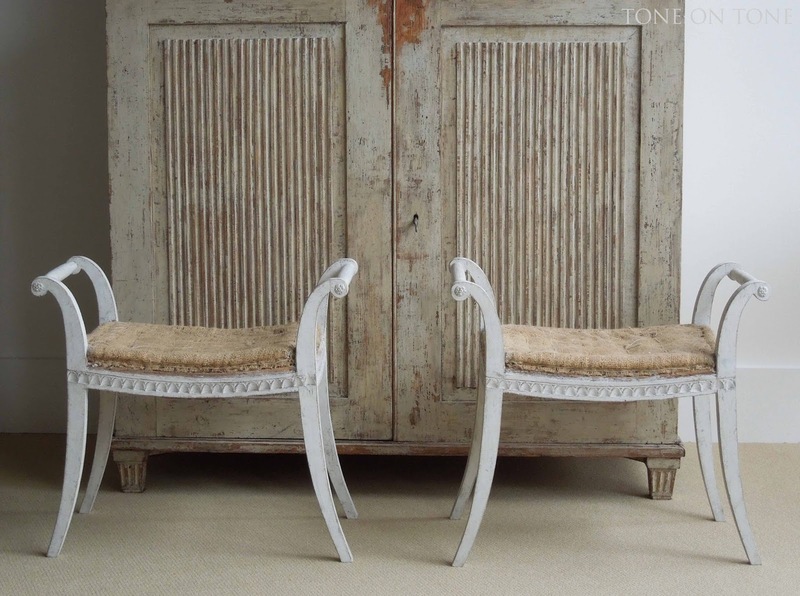 A pair of slightly larger Gustavian style ottomans with carved leaf tip rails and tapered legs with fluting. 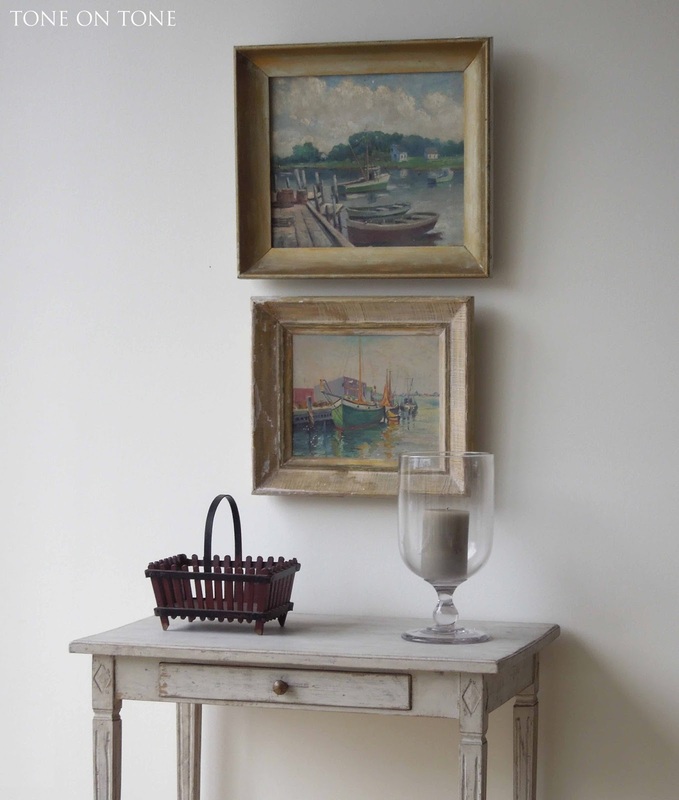 A stack of antique Swedish ironstone cheese stands on top of a large desk / small dining table from the 20th century. There are 2 concealed end drawers. Not super old, but still a fabulous table. THANK YOU FOR 10 SPECIAL YEARS! A Wintery White New Year!